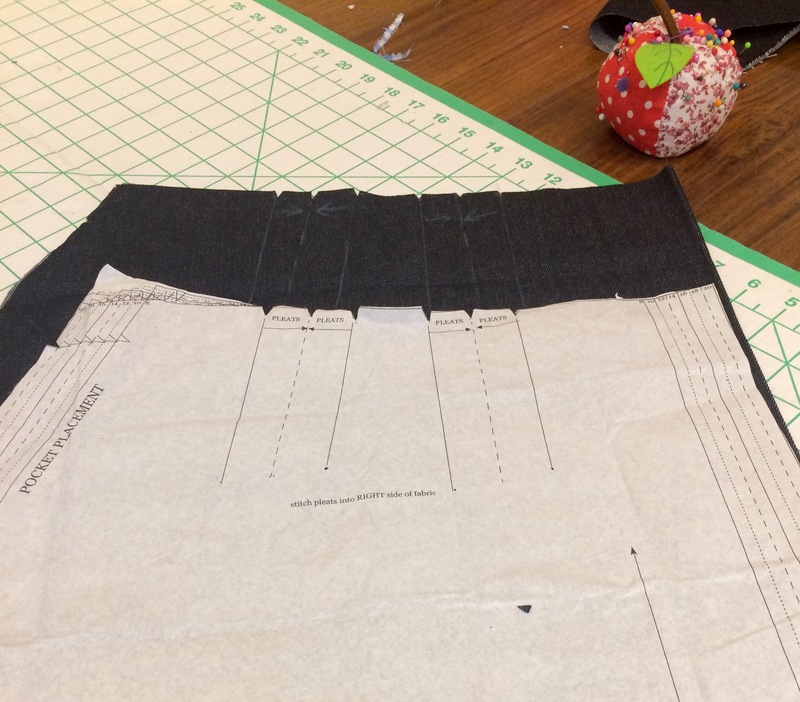 I was given this pattern by my pattern cutting lecturer at Morley College last year and I like the fact that it is was a simple style, and wanted to make it up but was waiting for the right occasion. 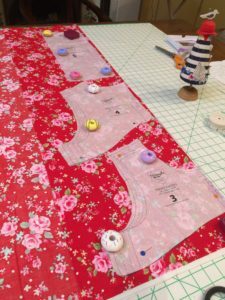 My Little One is now 5 and I made most of her clothes far too big (as in the early days I was worried I would not finish them before she outgrew them! 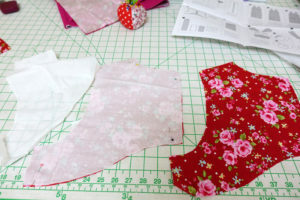 My worst nightmare) Consequently she has loads of summer dresses she had hardly worn. 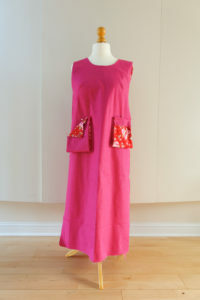 And here she is all finished. 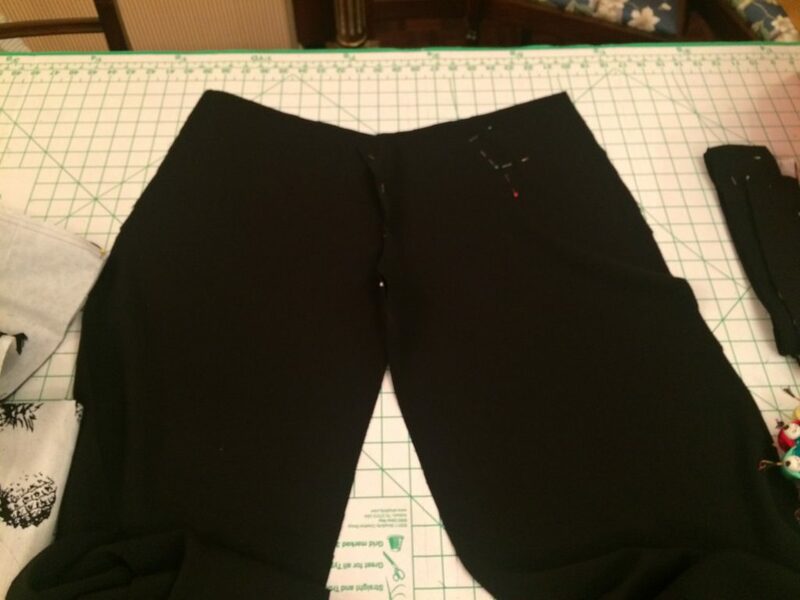 I was really happy with the way she came out. 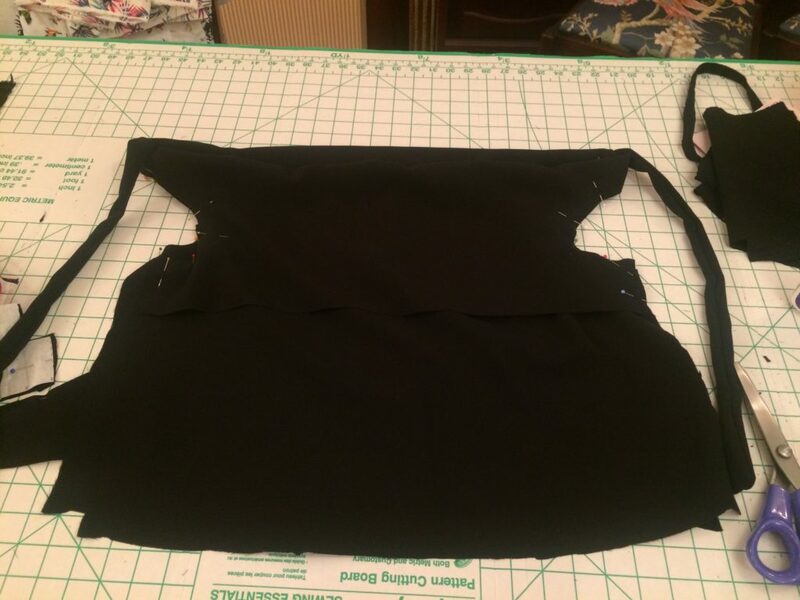 I would make her again for sure. 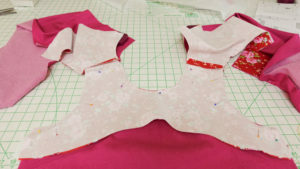 The only thing I did differently to the instructions was cut the bodice twice (i wanted the lilac and pink to show in the bows and stitched them together and then bagged out the bodice. 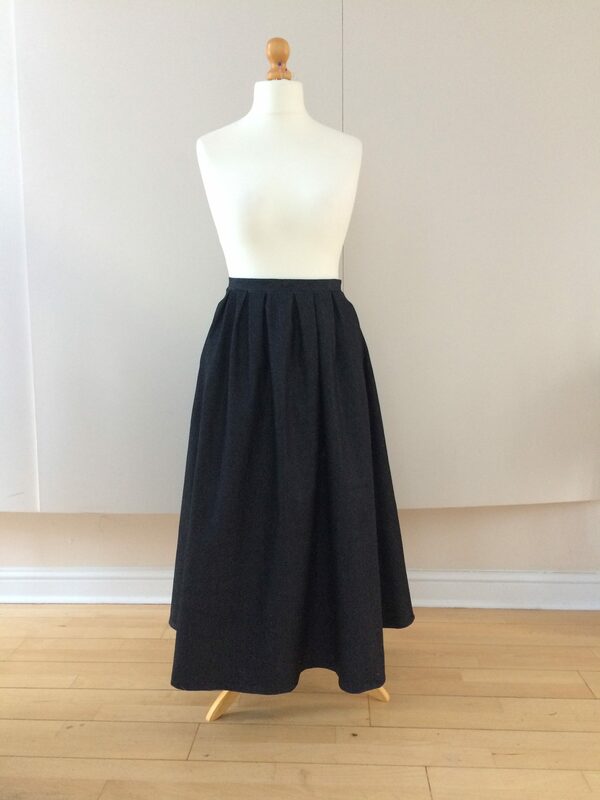 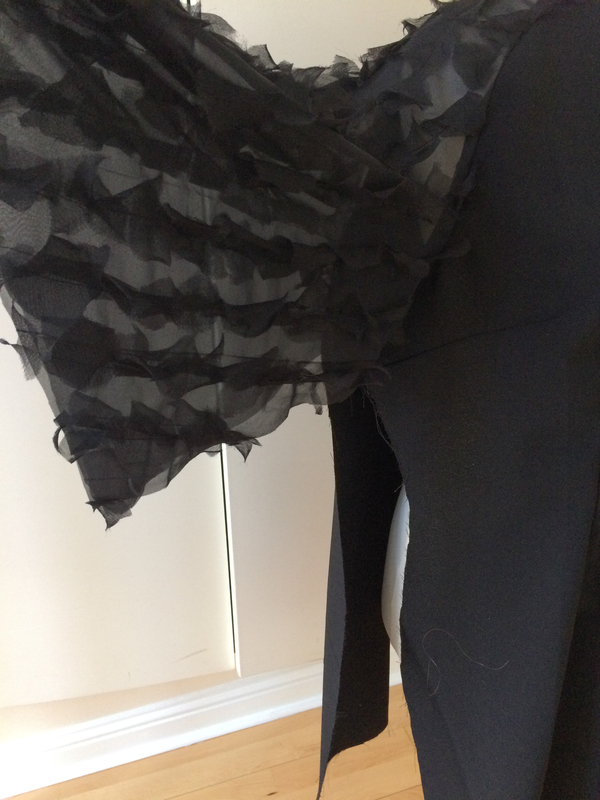 Then I cut the skirt twice, once in satin and once in organza. 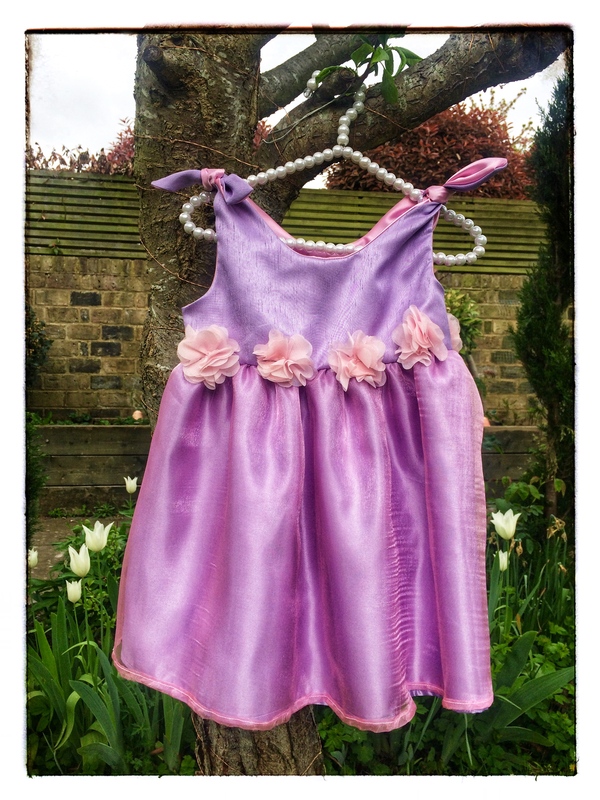 Perfect for a 1-year-old Princess. 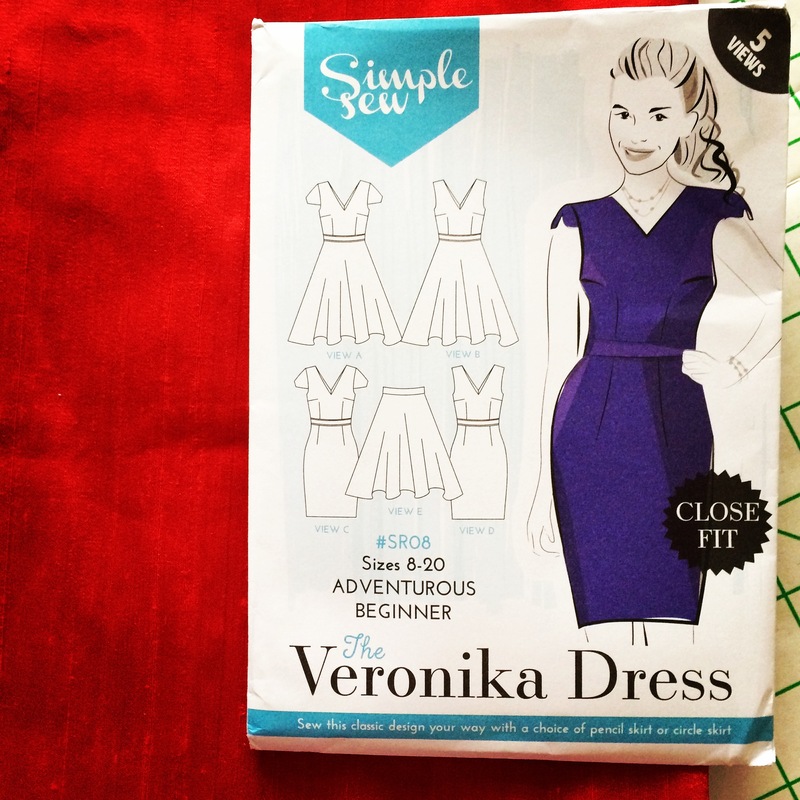 And fast and easy as Butterick claim. 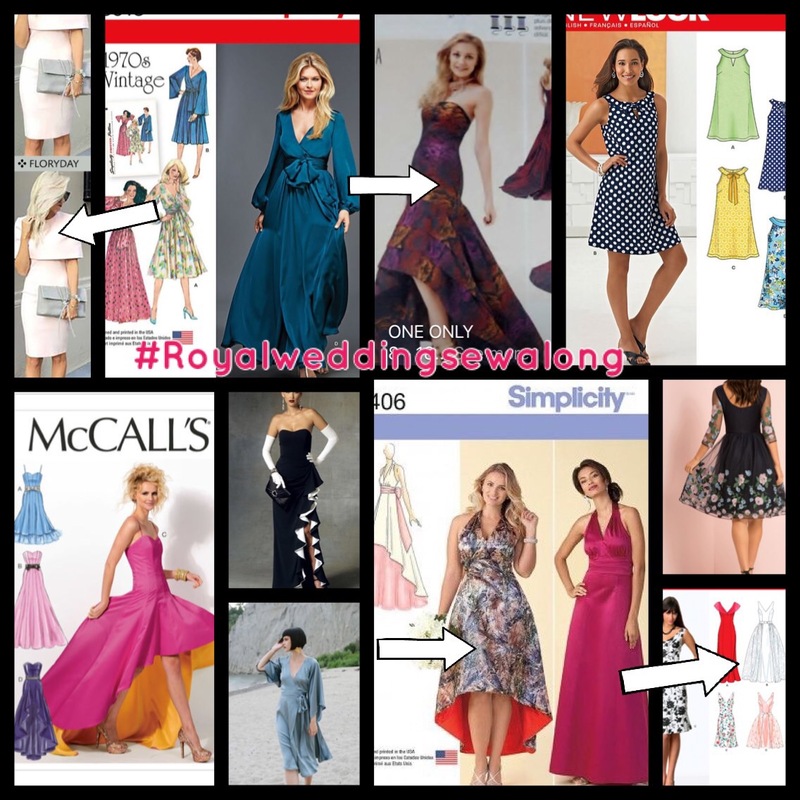 I have decided to join the royal wedding sew along by McCalls. 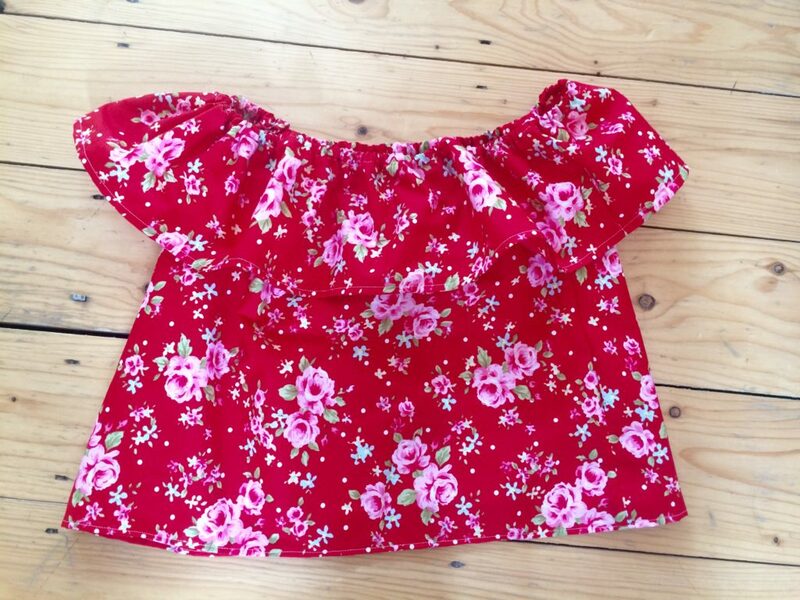 Firstly I am going to a wonderful wedding that day and I also have never sewn occasion wear for myself only my Little One. 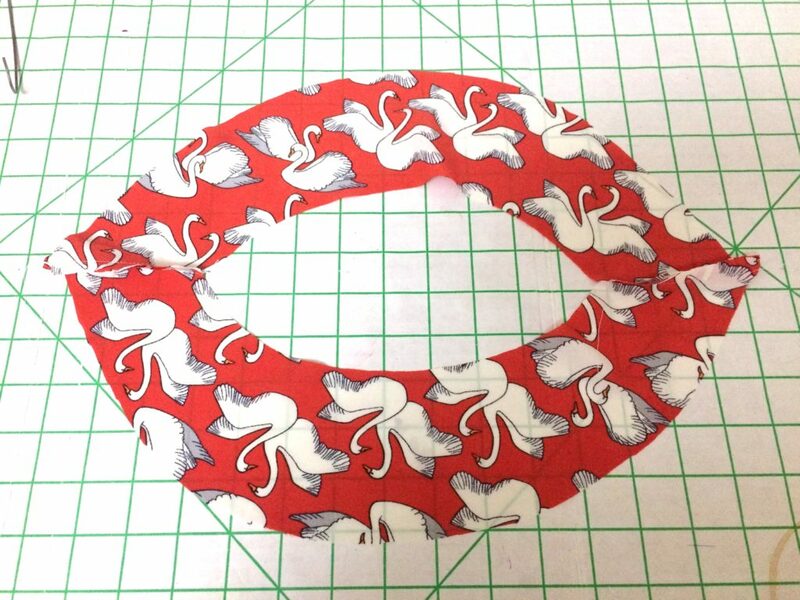 I ran into all sorts of problems as I couldn’t decide which pattern as you can see below. 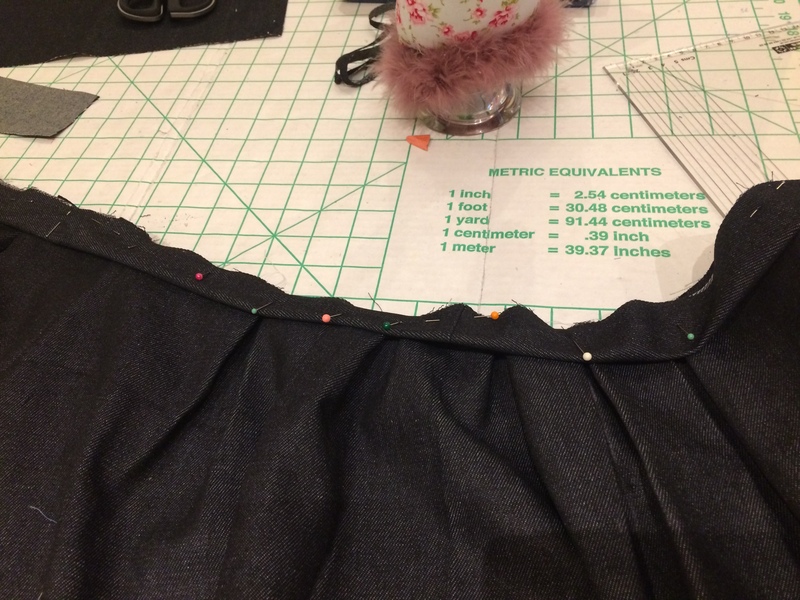 Some were too over the top and other were too understated and weren’t going to stretch my sewing skills. 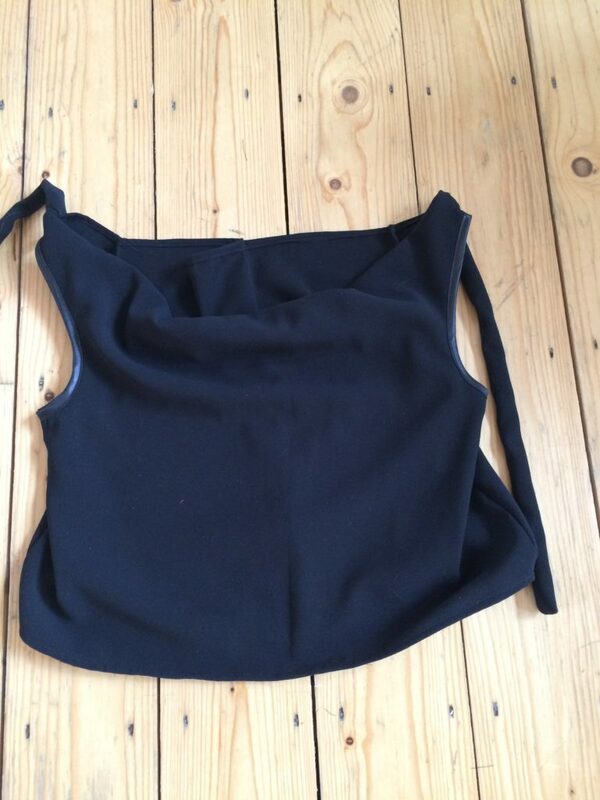 In the end, the ‘convertible’ won. 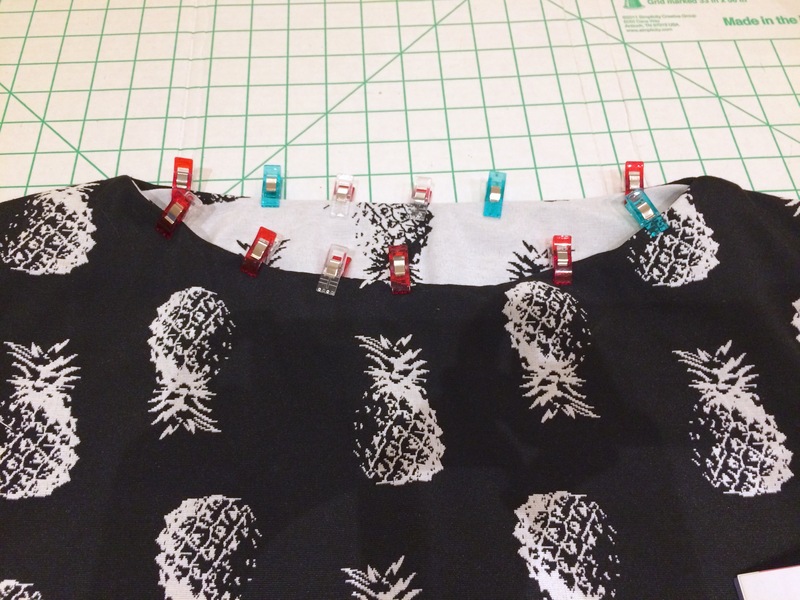 I chose this pattern as it is a simple shift dress with a fancy overskirt that you can button on and off, ideal as I love to dance. 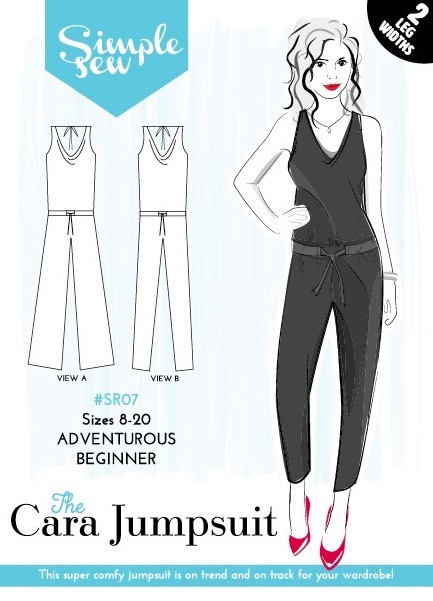 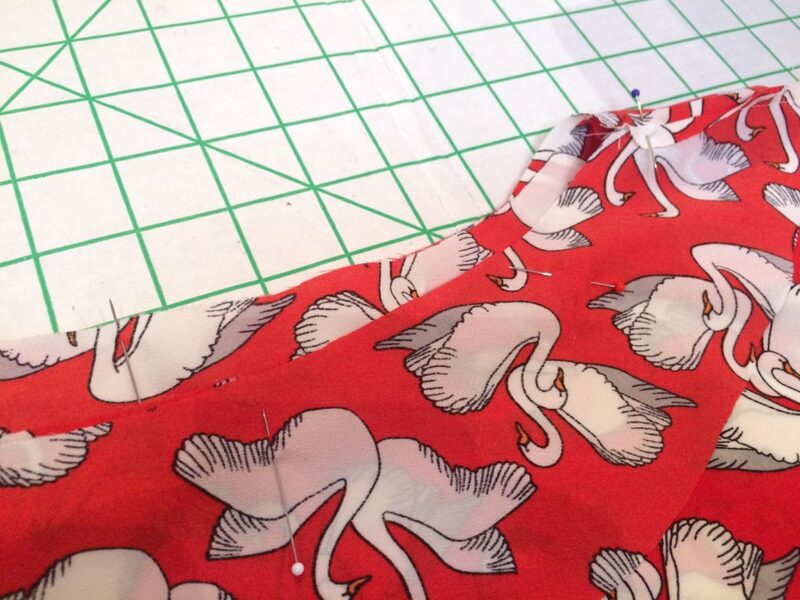 I have decided to do version C and E. This is because as my friend would prefer us guests to wear green, so I feel I will get the most amount of wear out of a short version. 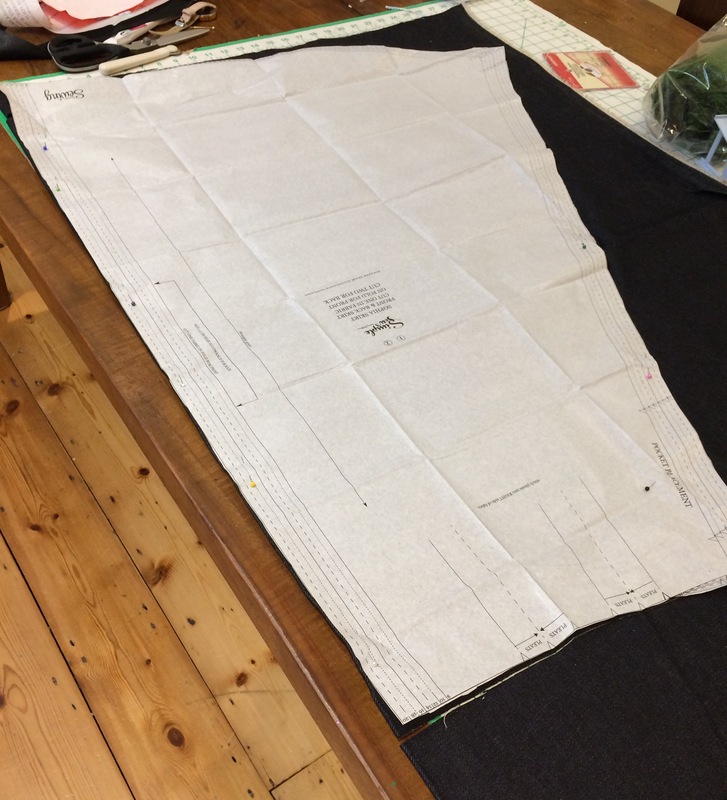 So now for the fun bit of to buy fabric, worth breaking my fabric diet over, I don’t own anything green (long story to do with my Grandad, Green Chartreuse, and a racehorse ;-0 ) so it was buy, or make, and where is the fun in buying when you can make it at twice the price, in double the time it would have taken to find one…only kidding, I hope. 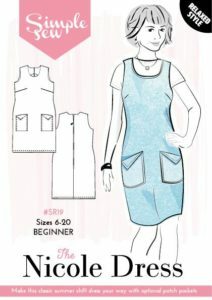 My latest make for https://www.simplesewpatterns.com is the Raglan Dress. 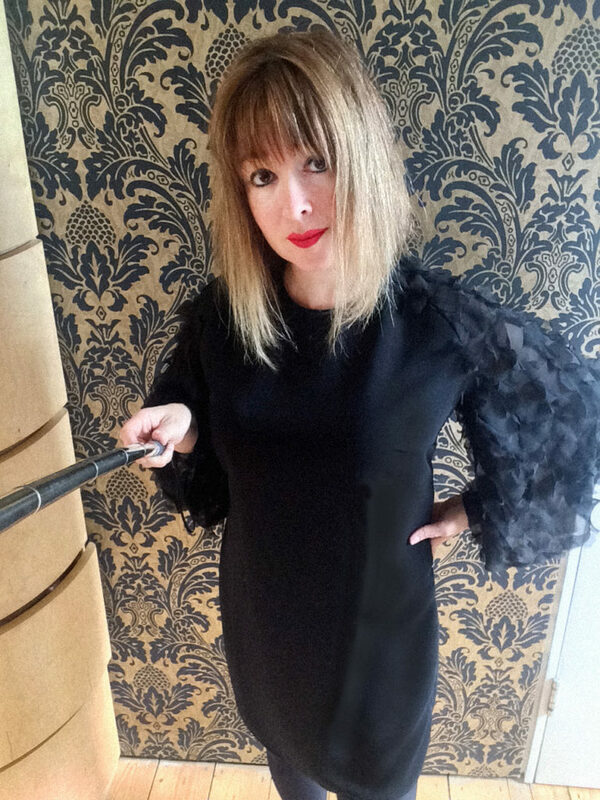 This dress was themed for the DressMakers Ball in Leicester, which I couldn’t go to but I know I will get loads of wear out of this dress, especially at Christmas! 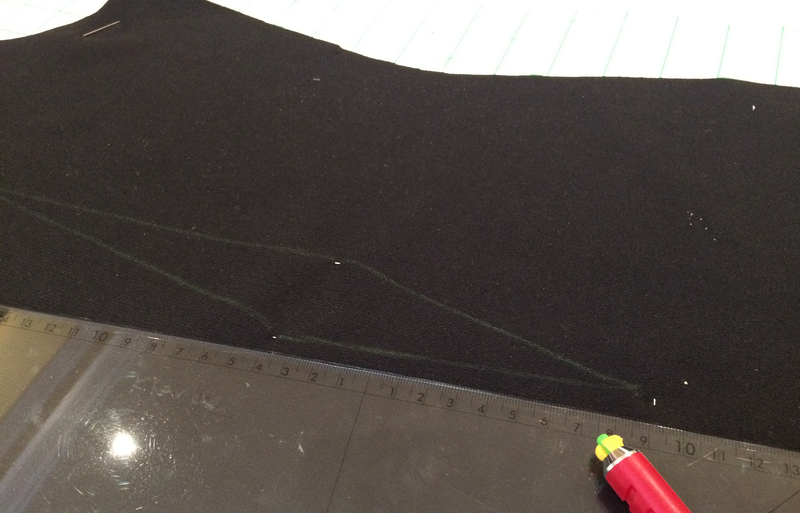 Next up was to mark the darts, first I pinned, then used chalk pen to drawn them on the fabric before I tacked them. 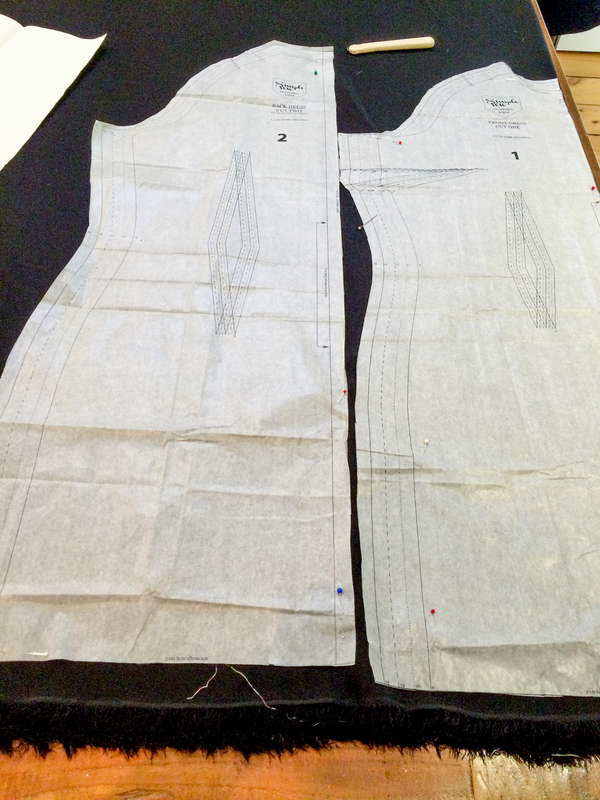 Drawing the darts, they do look a lot wonkier than they actually were in this photo! 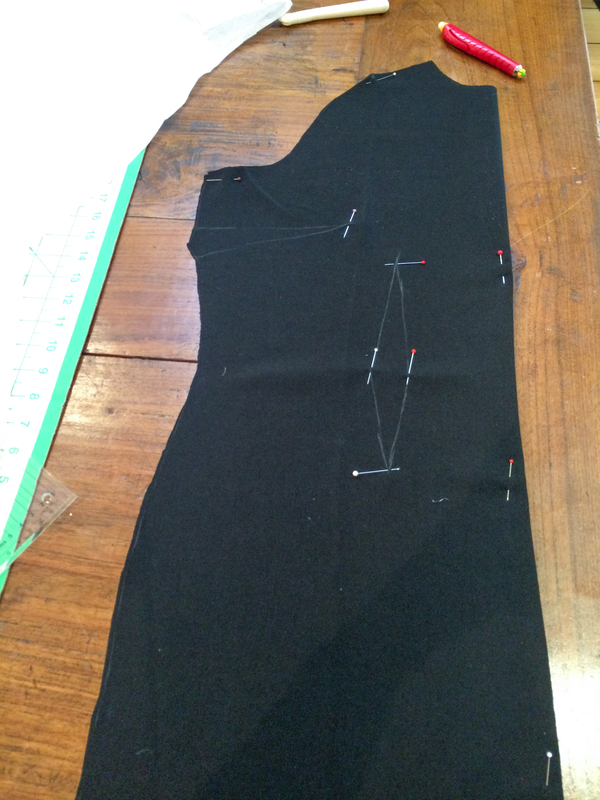 Here I have tacked the darts – sorry for the poor photo, black is really hard to photograph!! 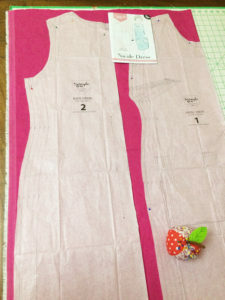 Bust and front of dress darts tacked. 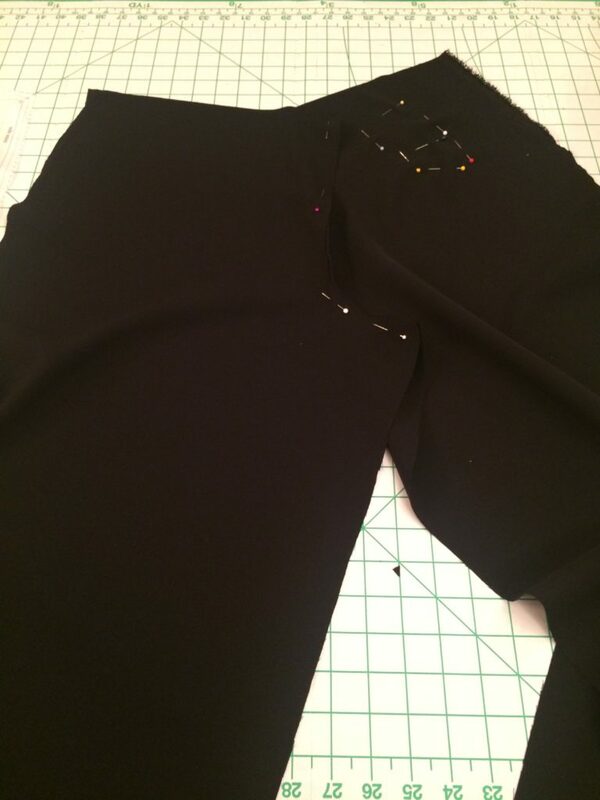 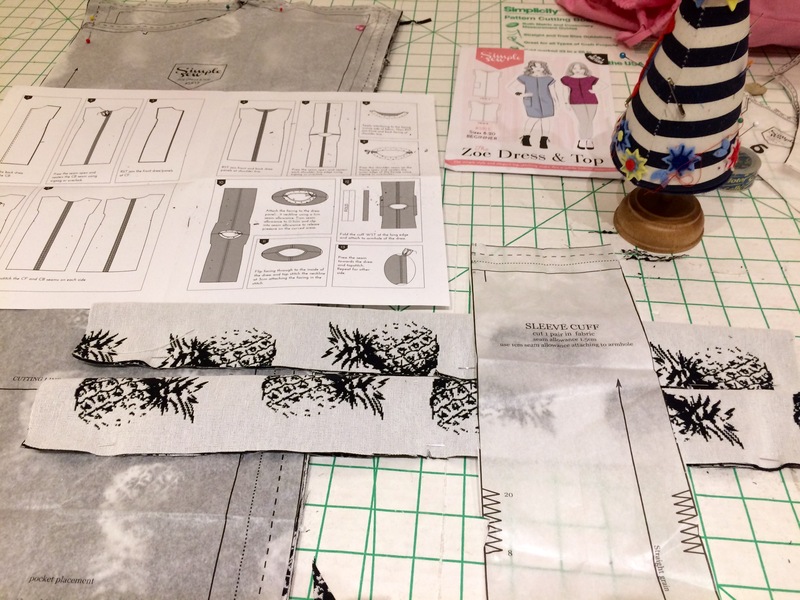 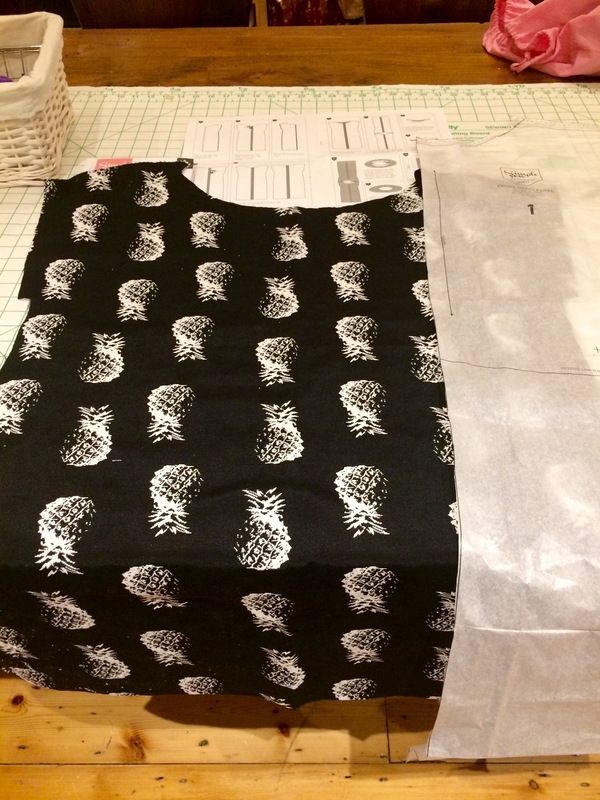 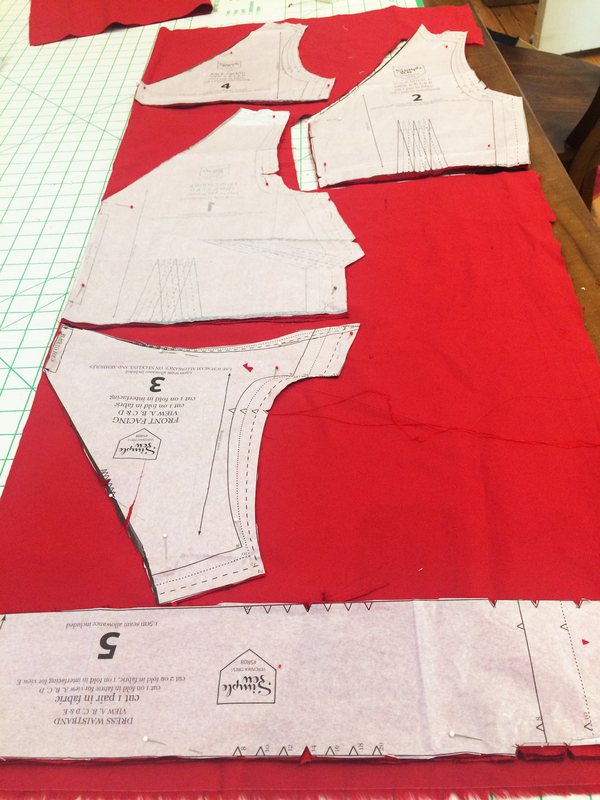 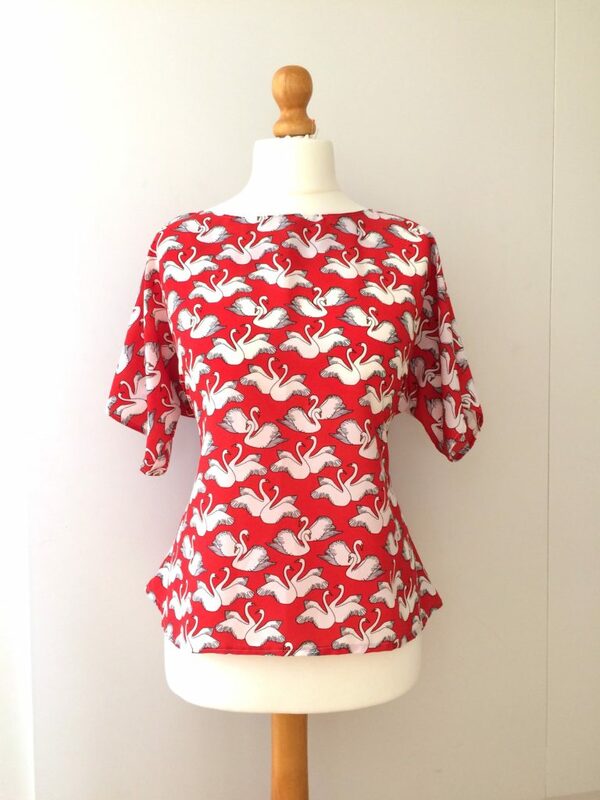 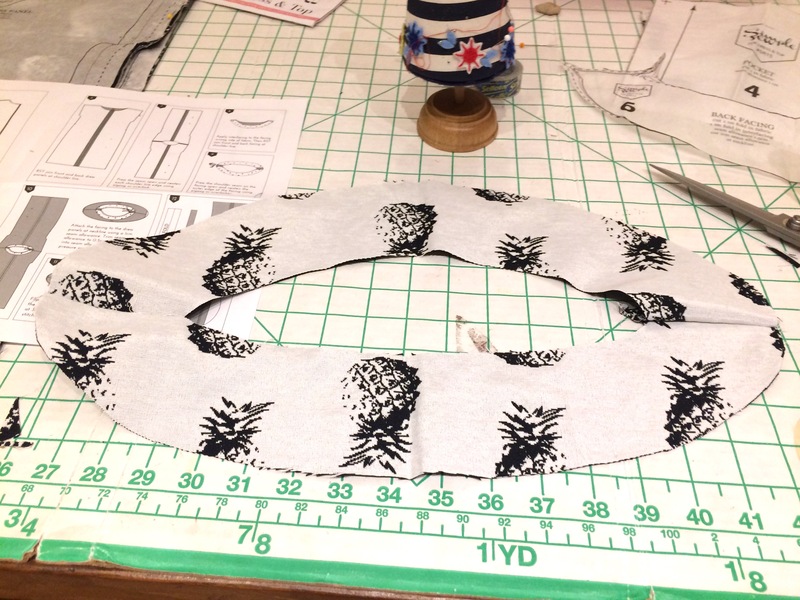 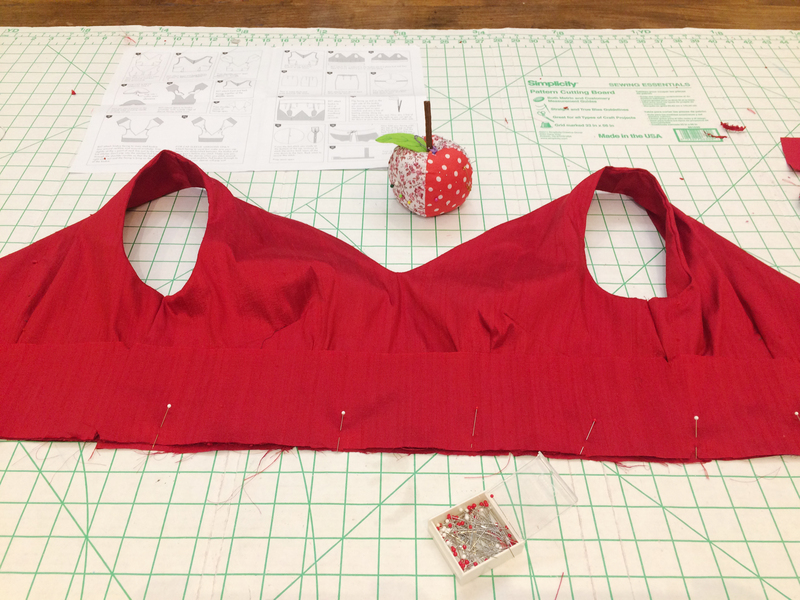 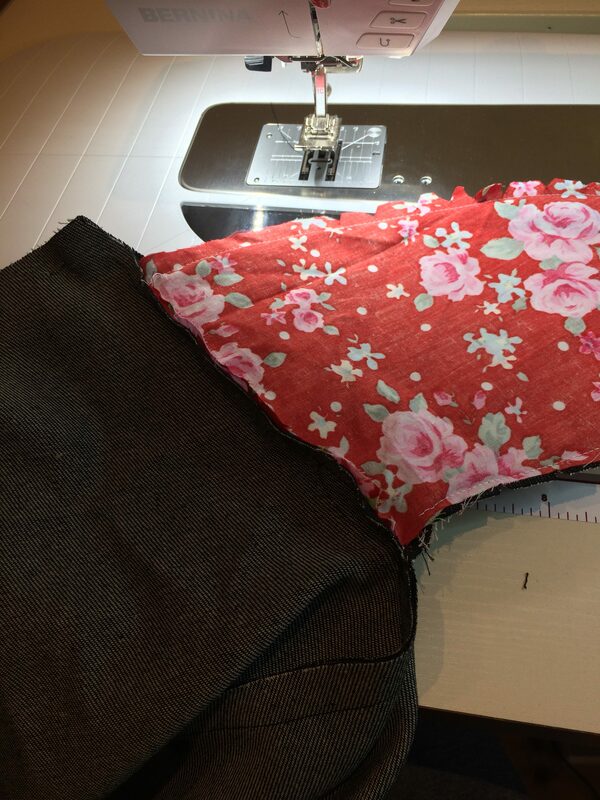 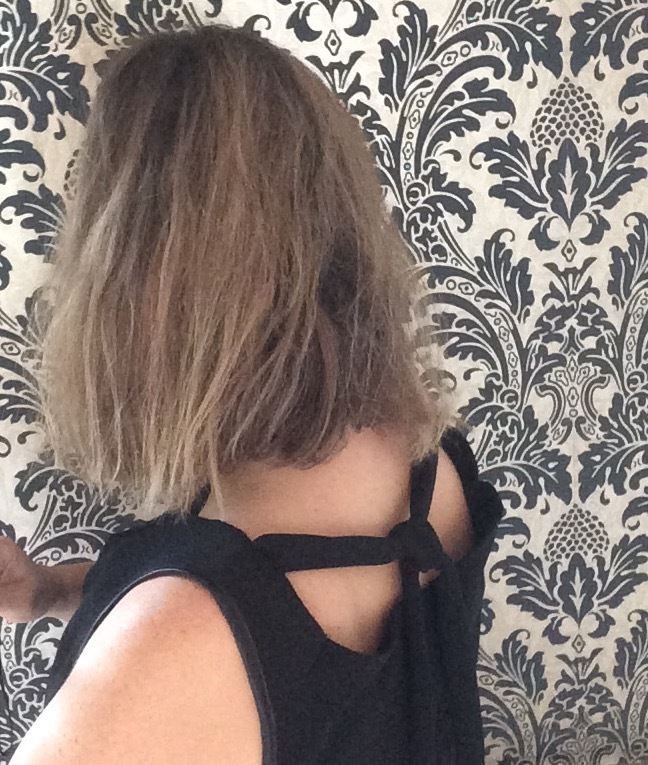 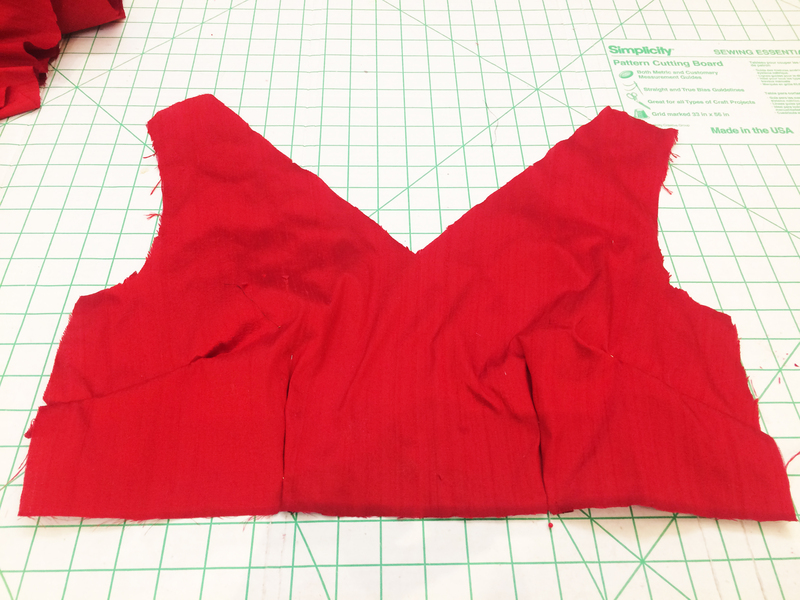 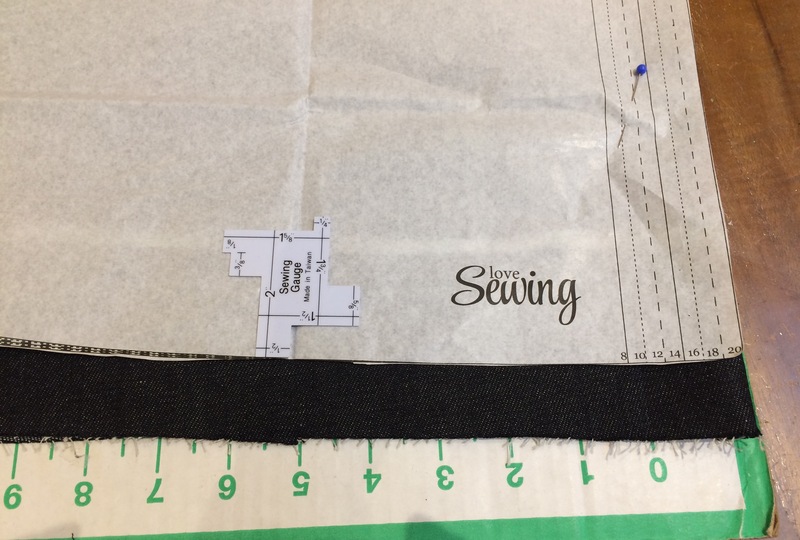 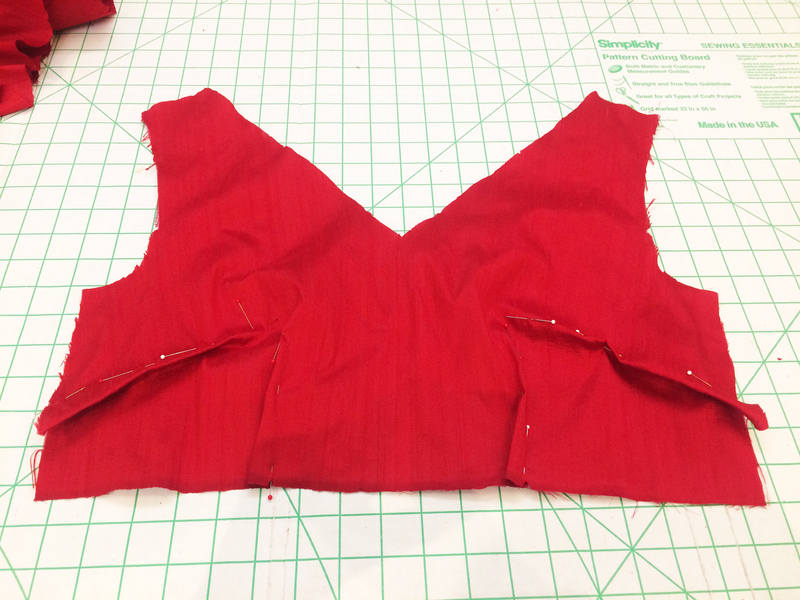 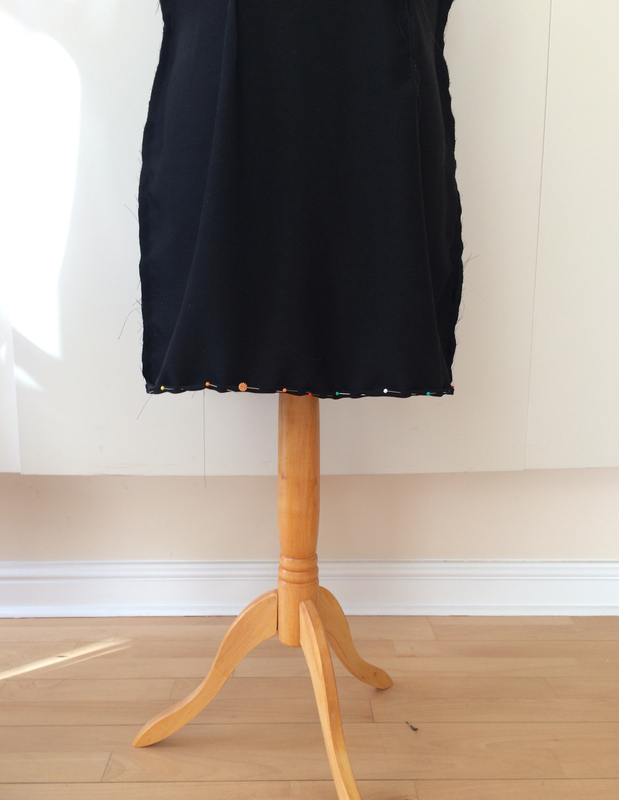 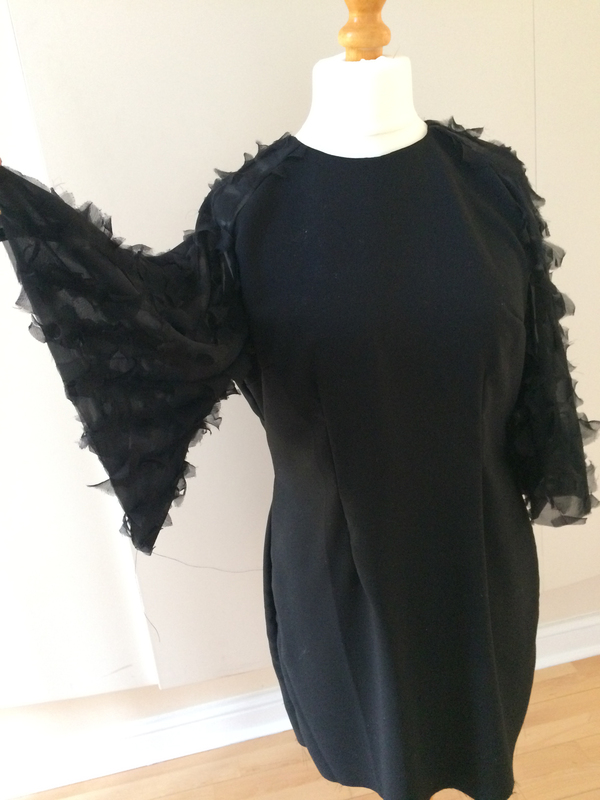 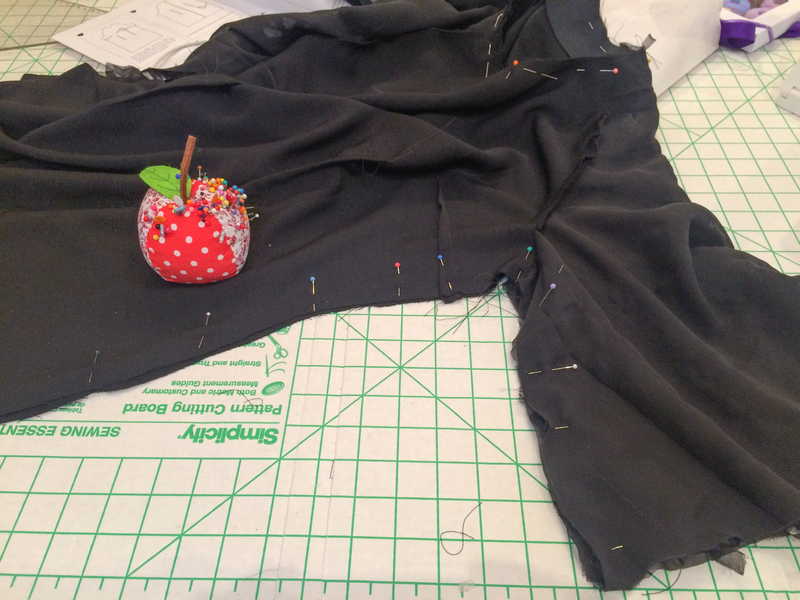 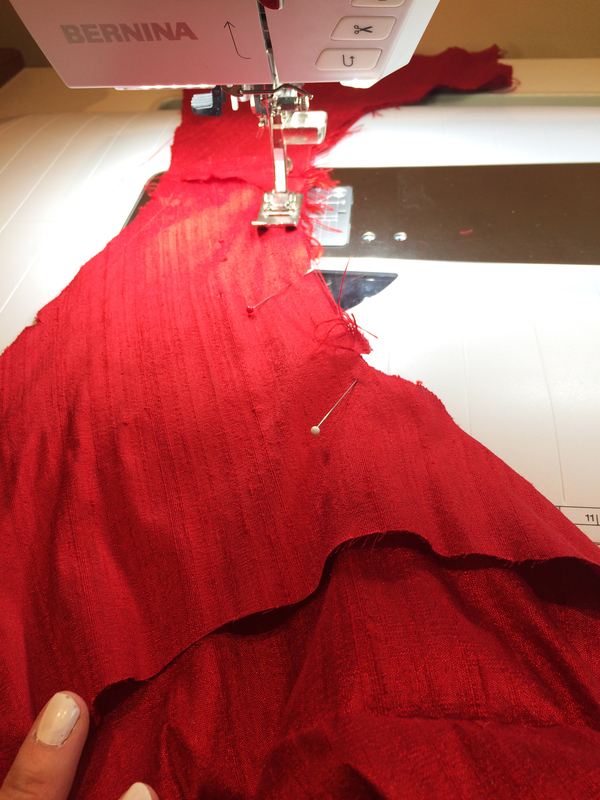 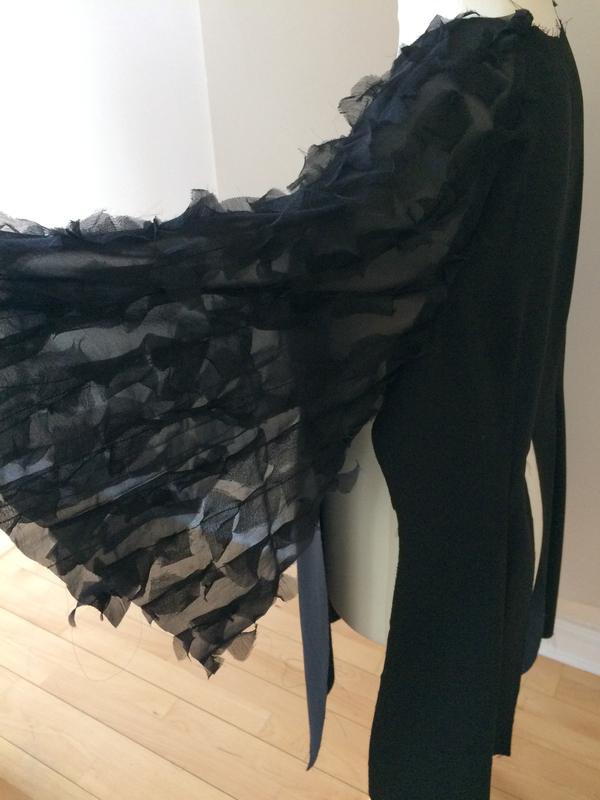 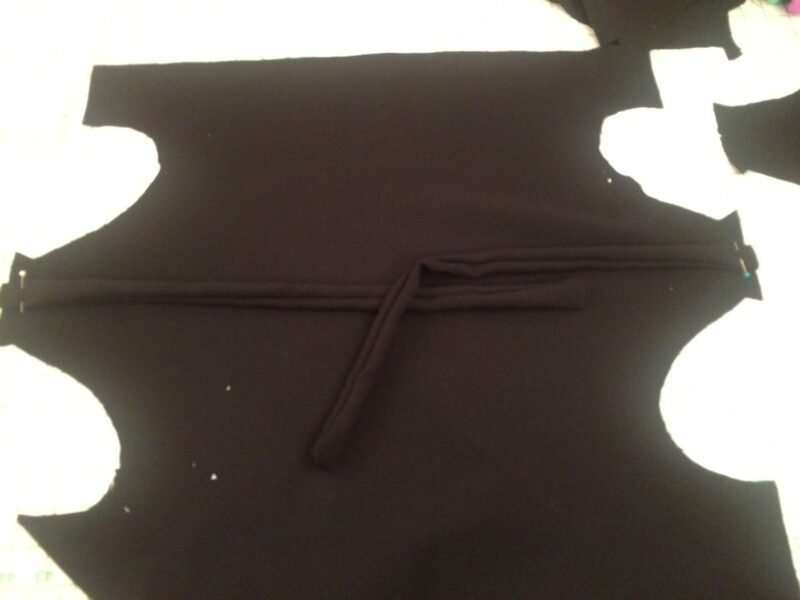 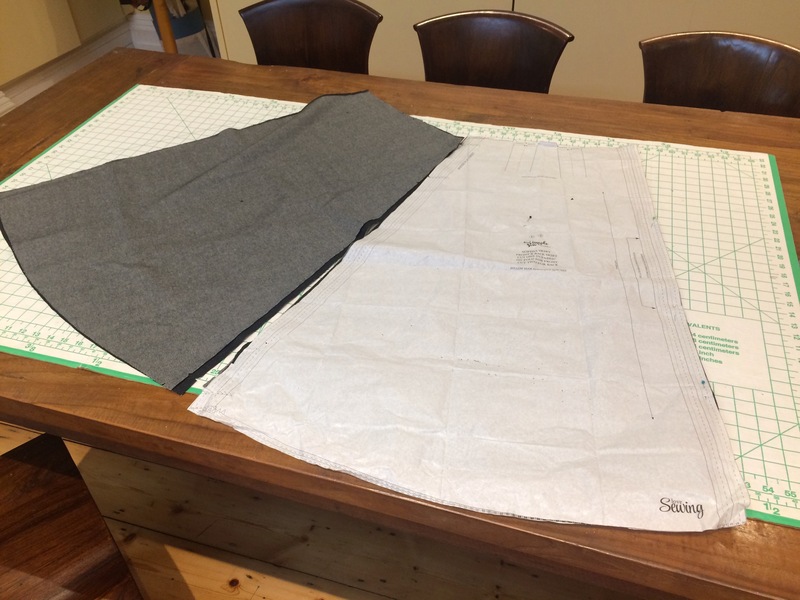 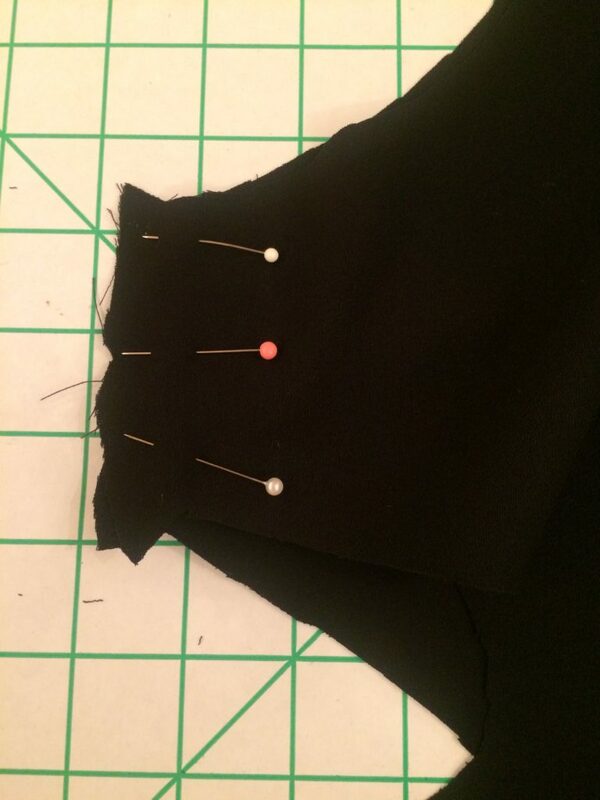 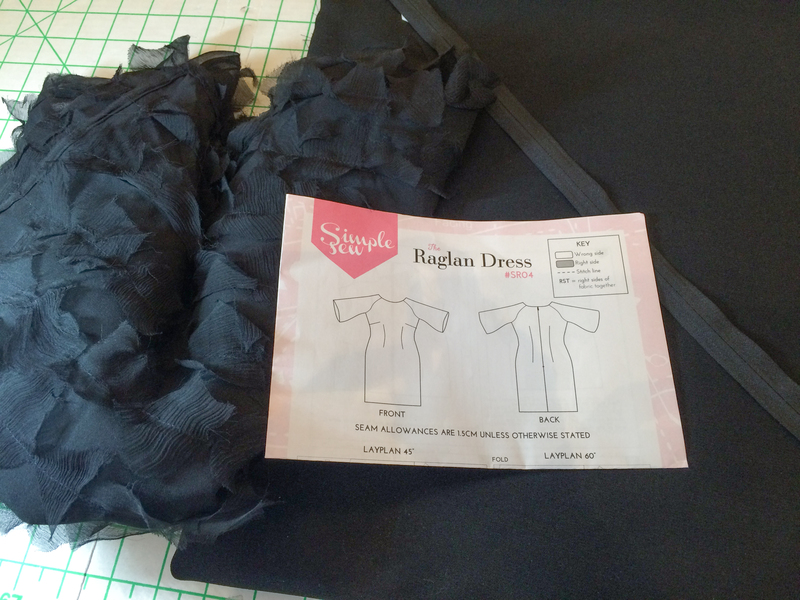 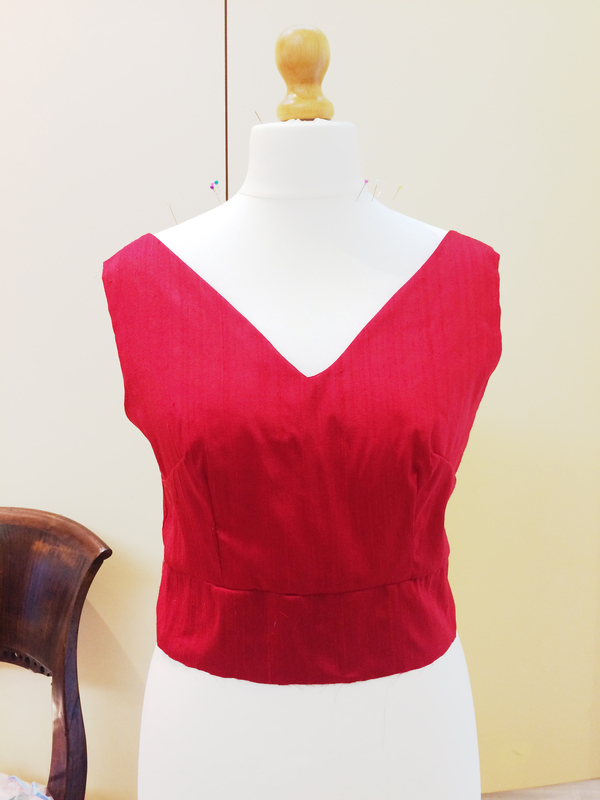 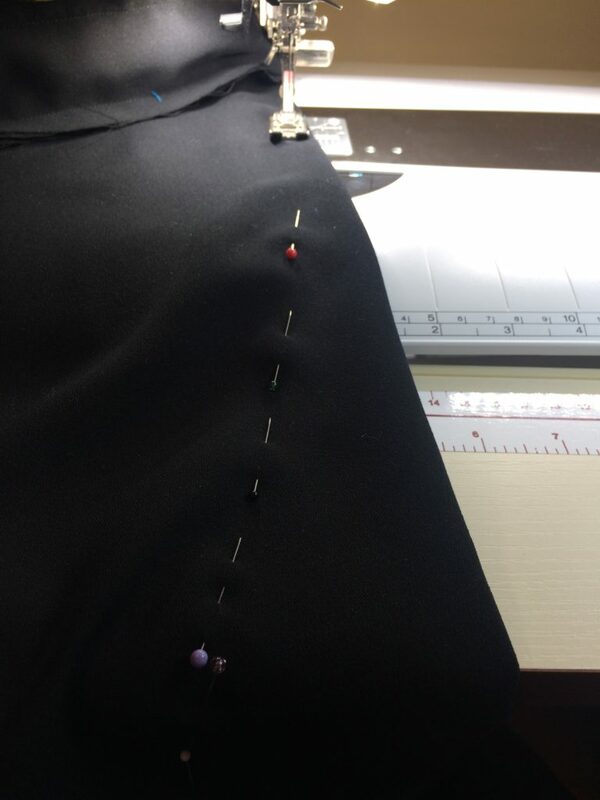 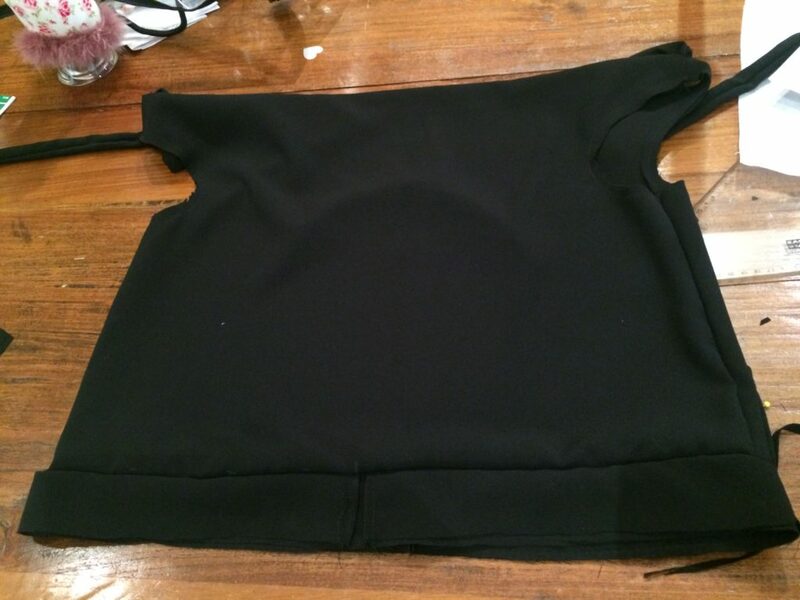 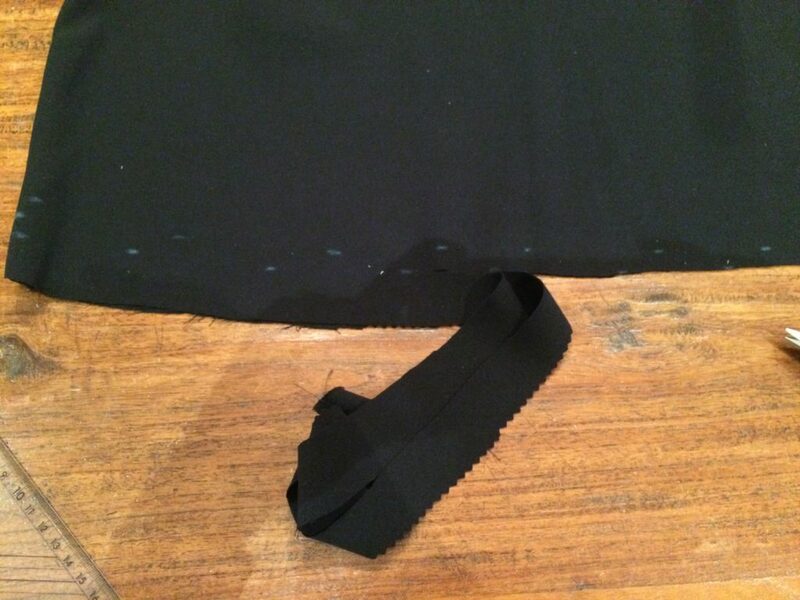 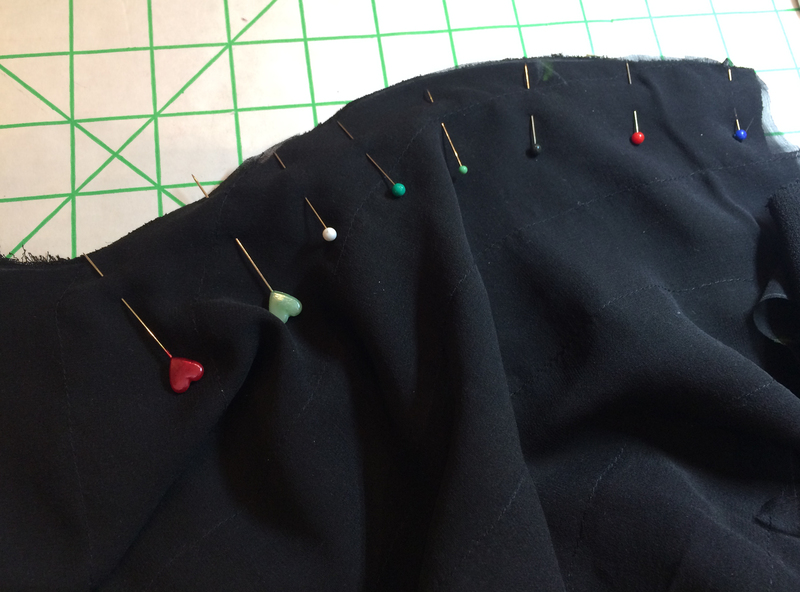 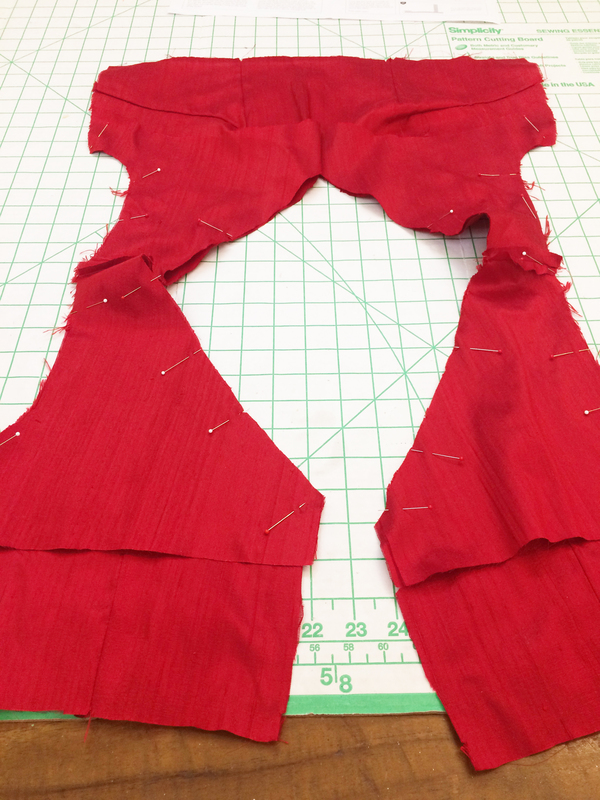 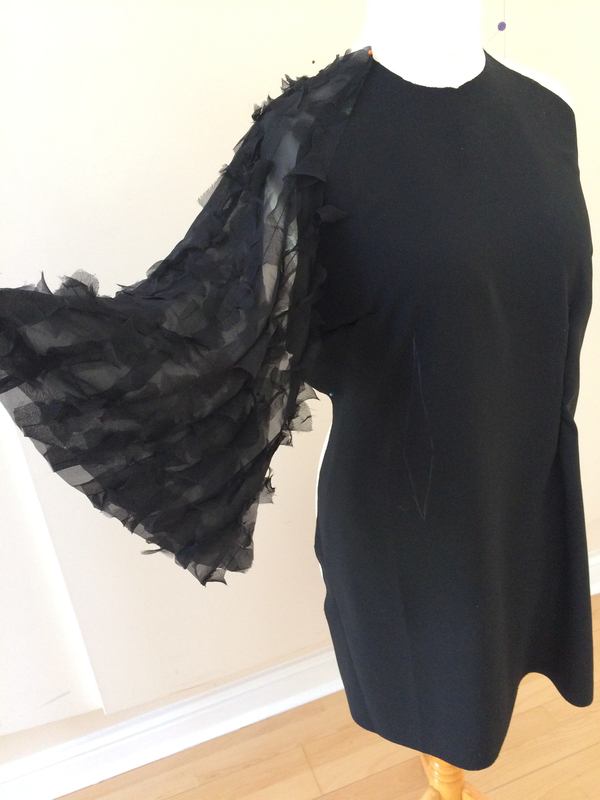 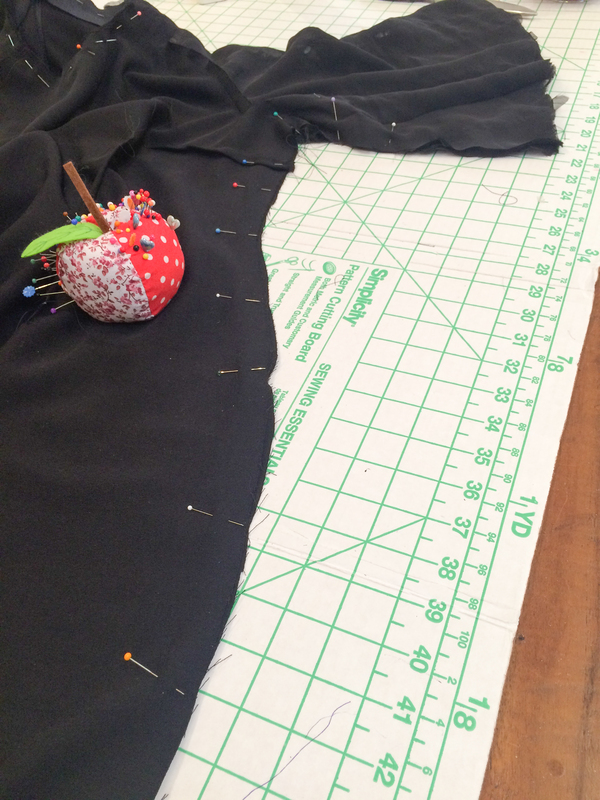 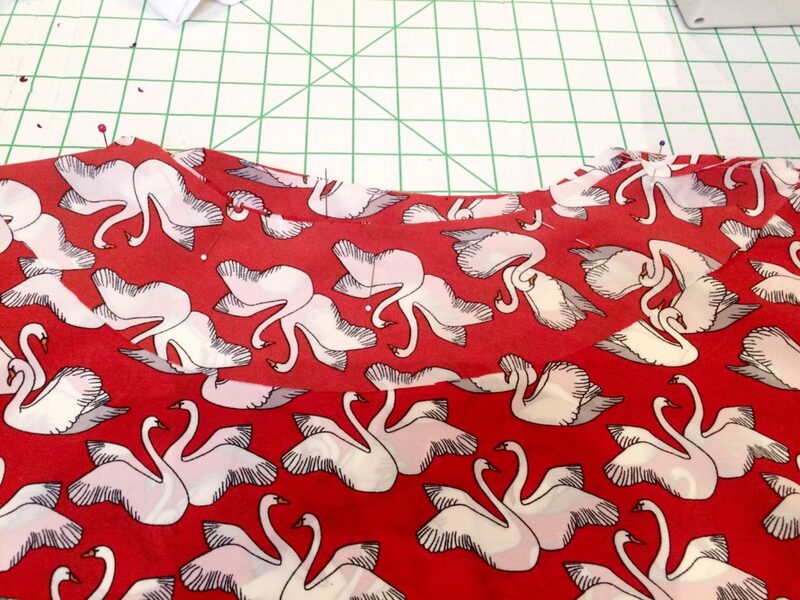 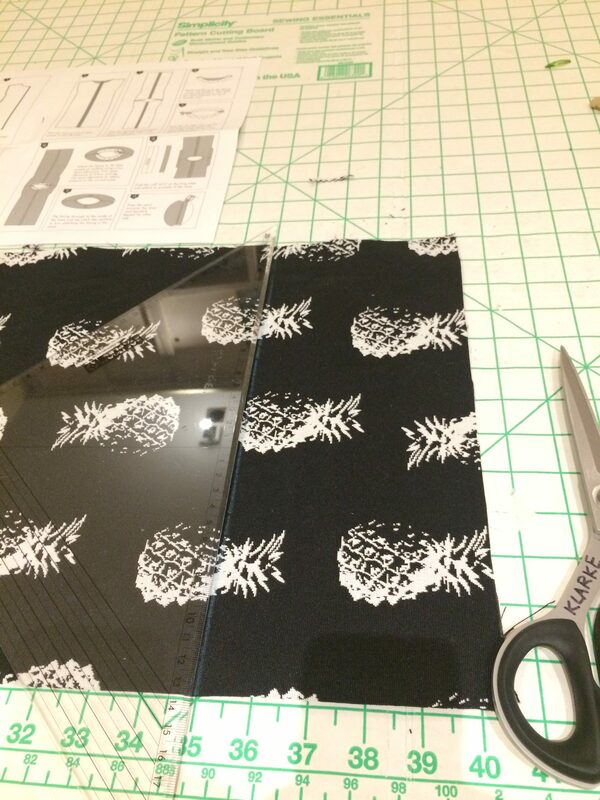 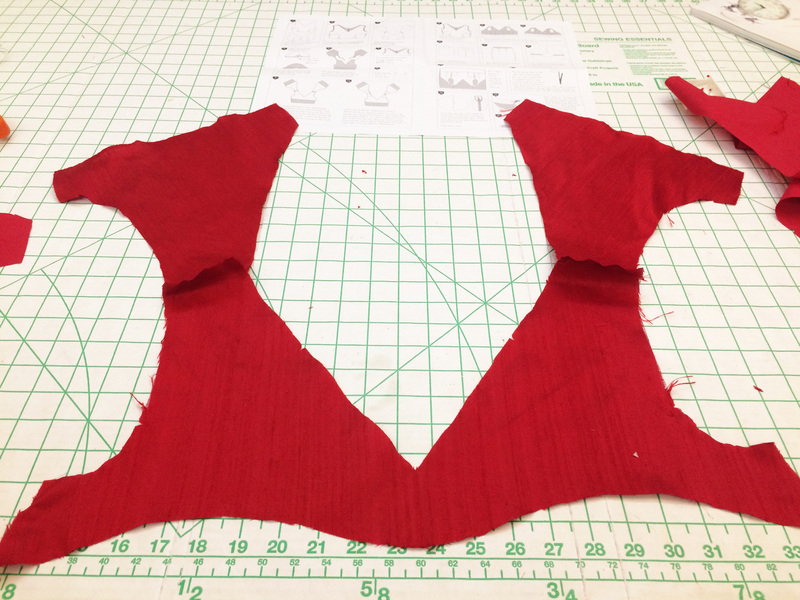 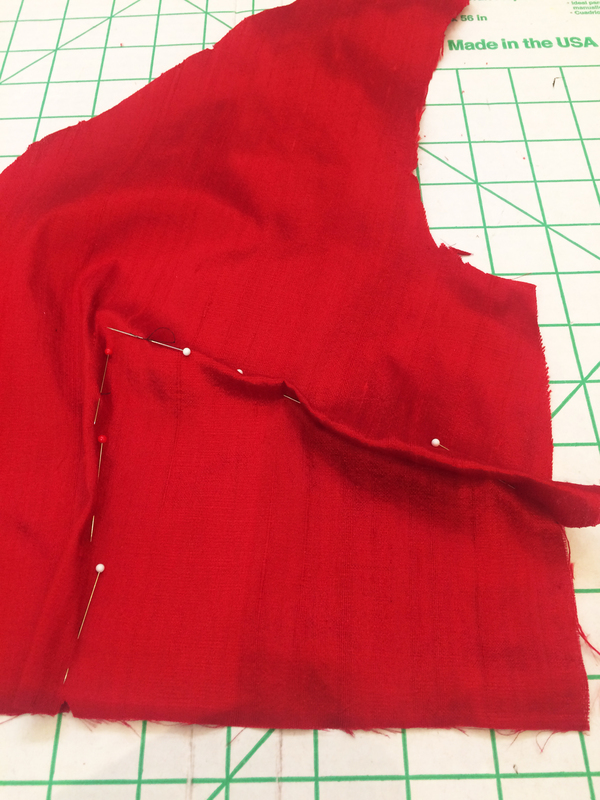 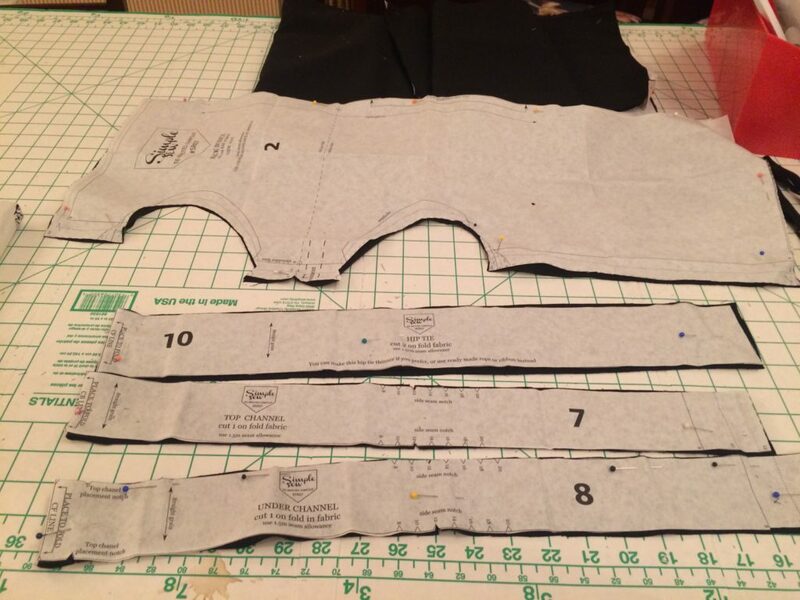 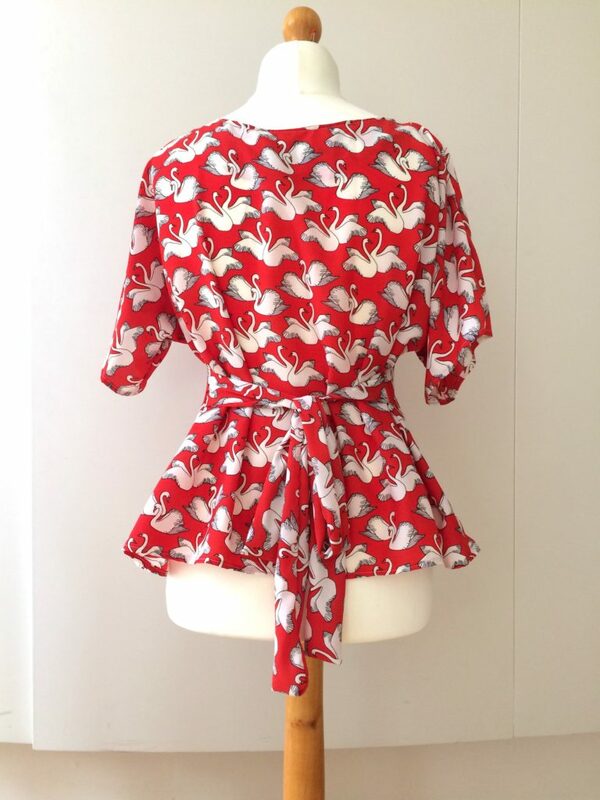 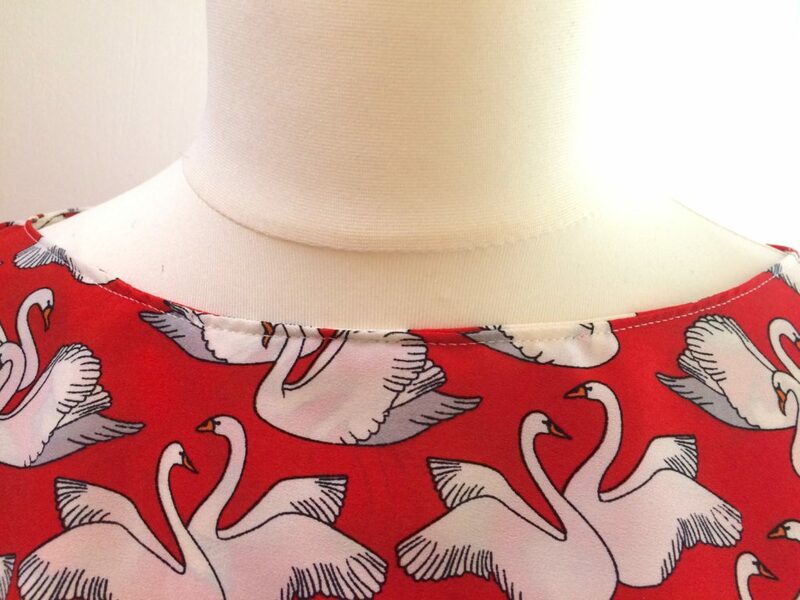 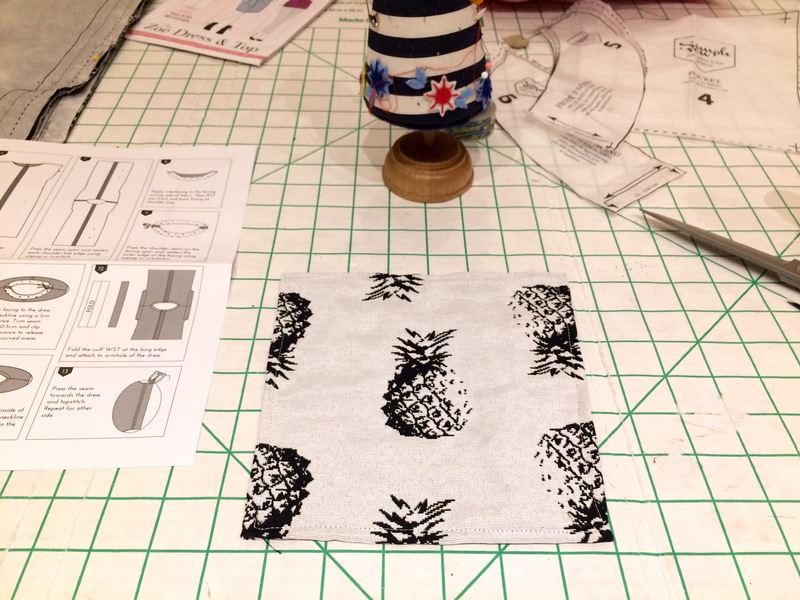 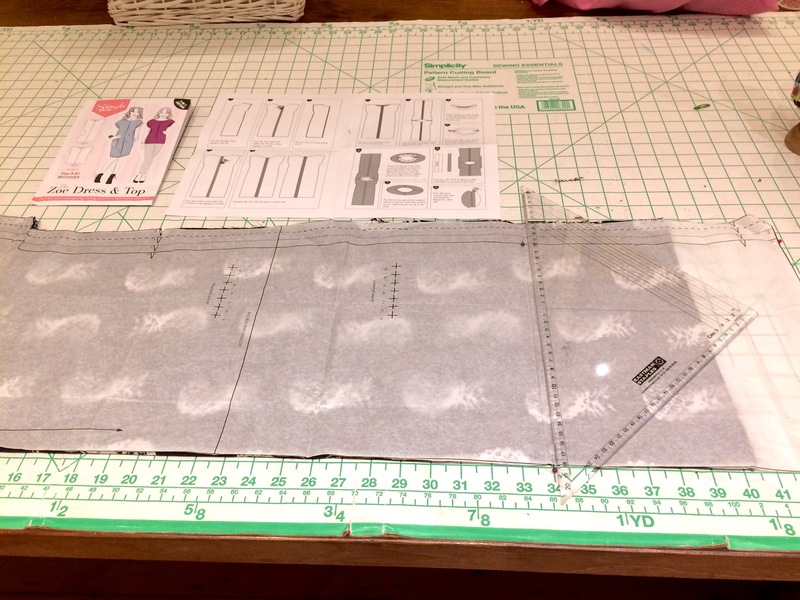 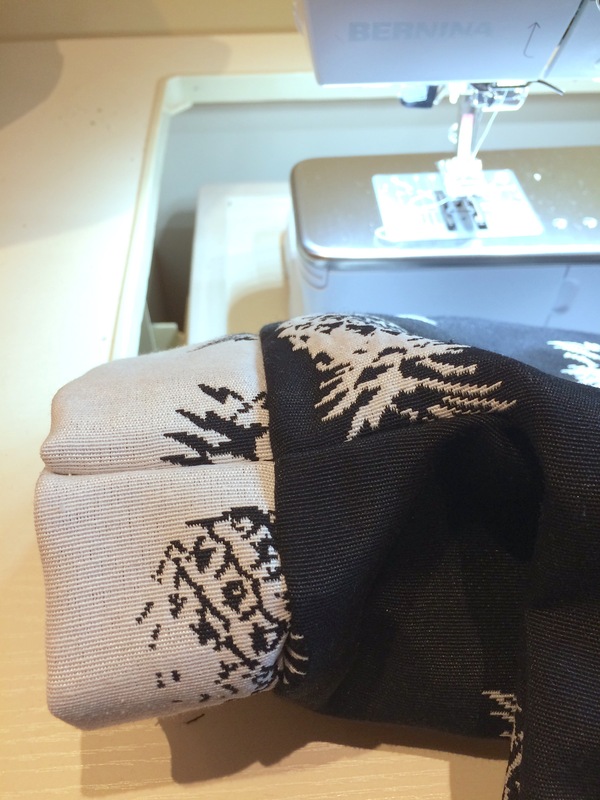 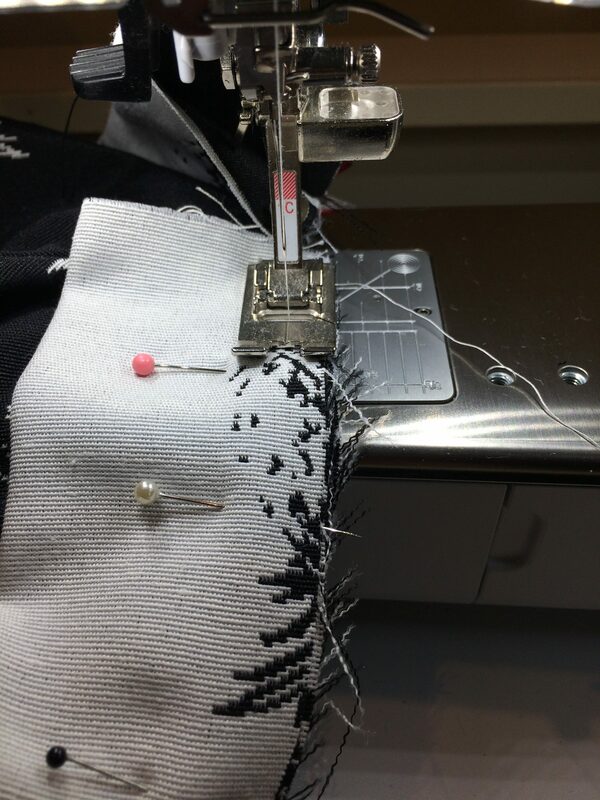 I then pinned the sleeves together…and I can’t wait to see what it looks like so …. 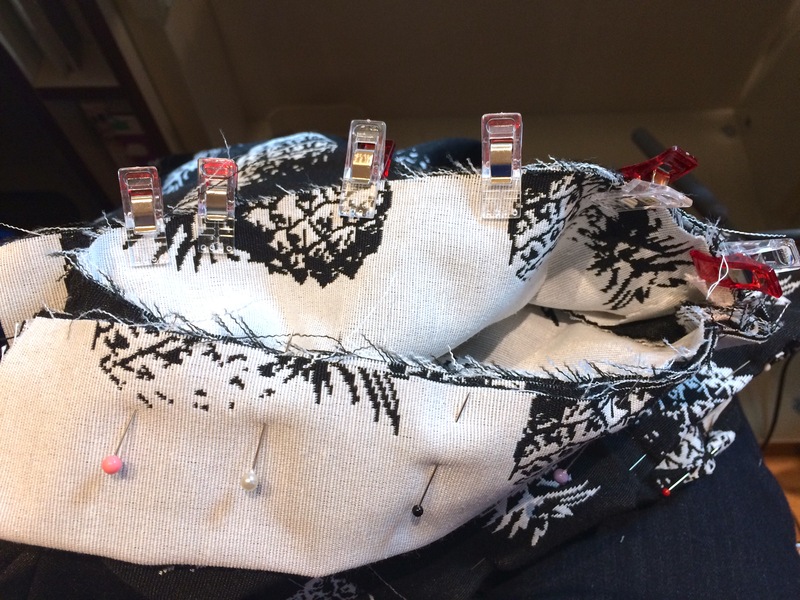 Had to pin it on my dummy Flossie to have a sneak peek, does anyone else do that? 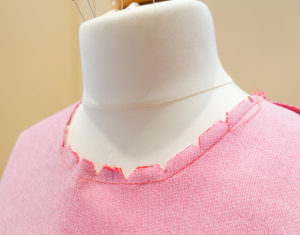 So back off Flossie and now time to cut the facing for the neck. 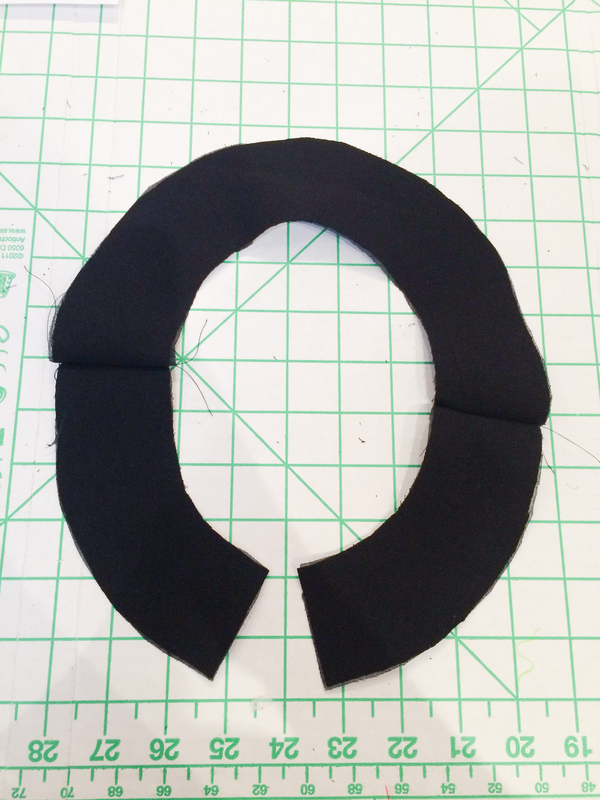 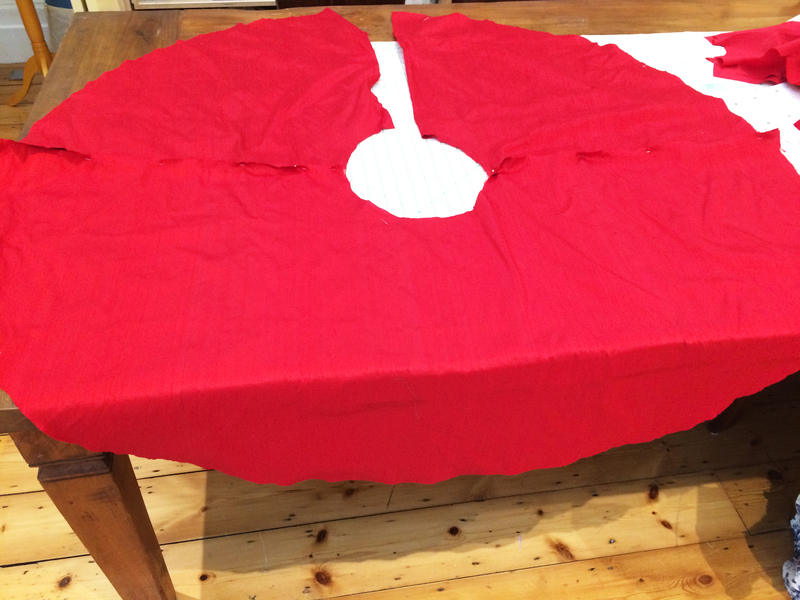 I used a light weight interfacing and joined the 2 parts to make a circle. 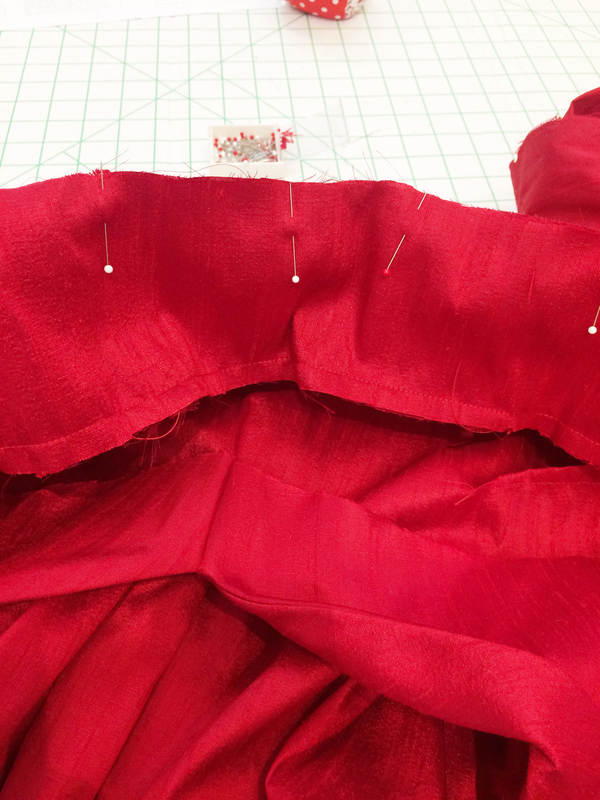 I left the fabric to drop over night before I pinned the hem. 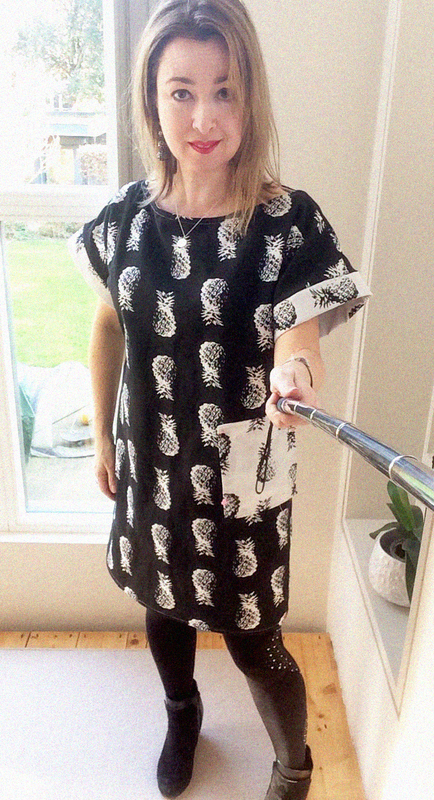 Here she is, rather hard to photograph, so used my selfie stick for the first time! 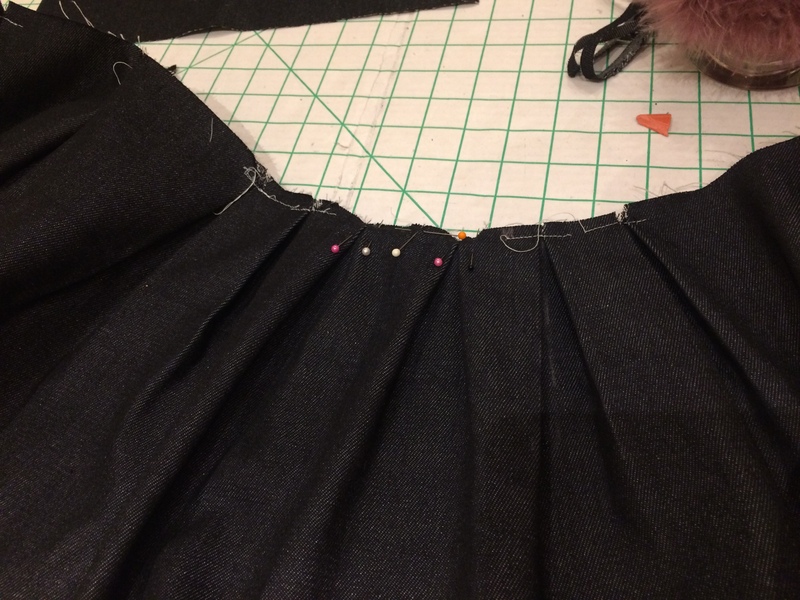 I took out the darts on the front and back as the fabric hung better that way and I think it needs to be taken in a bit, but am really happy with it. 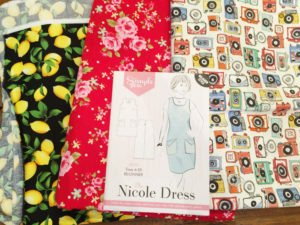 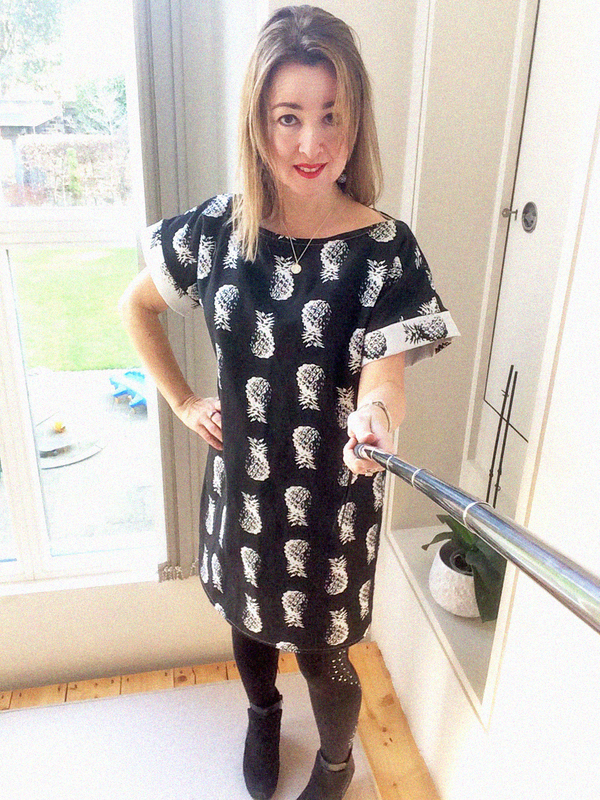 Sew, my second make as a blogger for Simple Sew is the Nicole Dress. 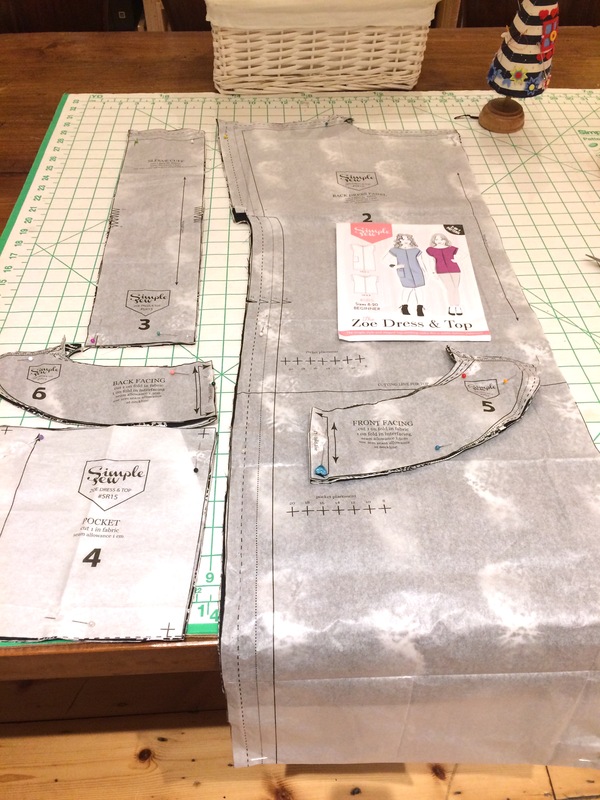 I liked the denim look that Simple Sew had made it in but as I have just finished making a blue denim dress I wanted to try a different look, and I had plans for a pattern hack. 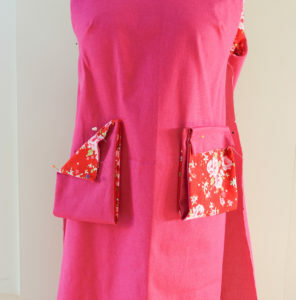 I love a dress with pockets, maybe its because I am a photographer I need some where to put bits! 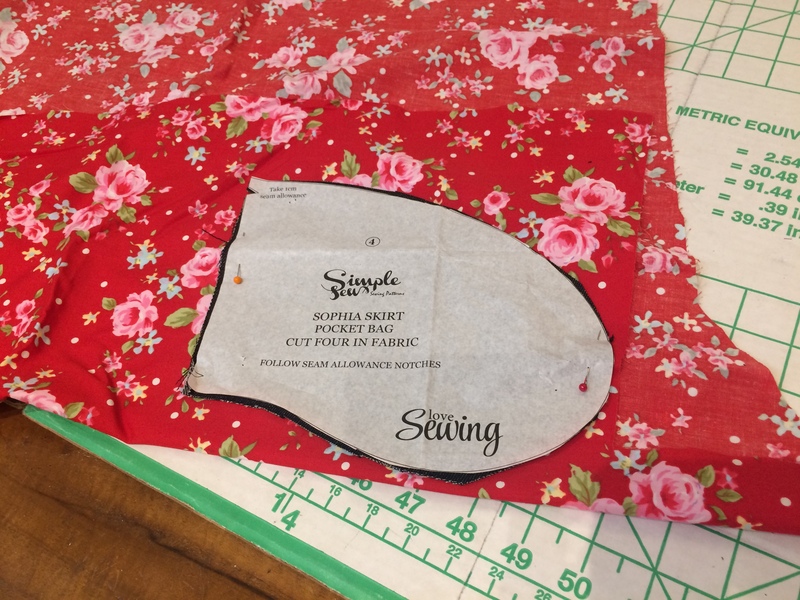 So I had a rummage through my fabric stash to see what I could make it in as I am on a mission to sew my stash this year. 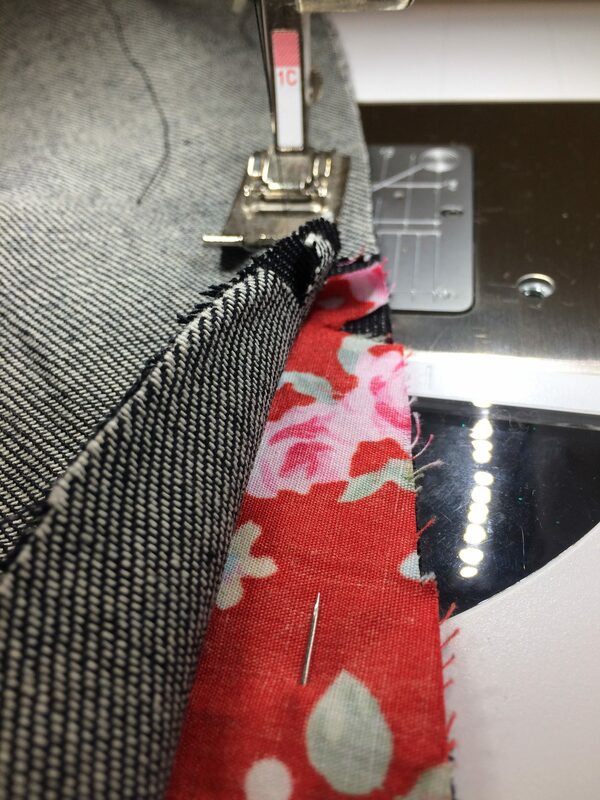 I have way to much fabric, not to be called a fabric collector now and although its great insulation for my home, I feel I need to free my pretties and get making beautiful things with them. 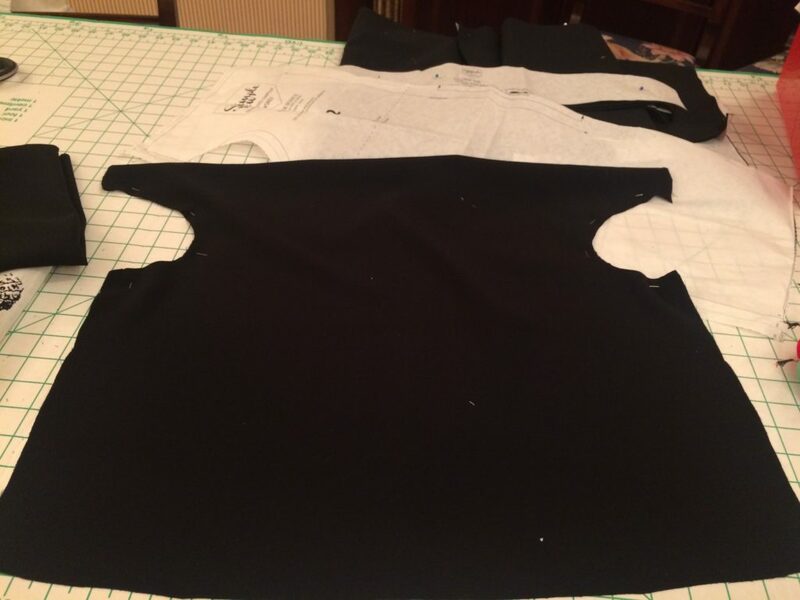 I am going to write a post about my mission towards zero waste fashion at a later date – watch this blog for details. 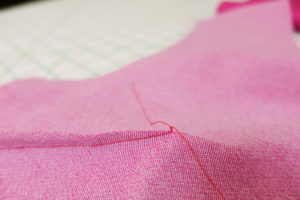 But in the end I choose a pink stretch denim that my friend Rebecca of http://www.livingabstracts.com (check out her brilliant Instagram Course) gave me and the red floral cotton from http://www.fabricland.co.uk for the facing and pocket contrast. 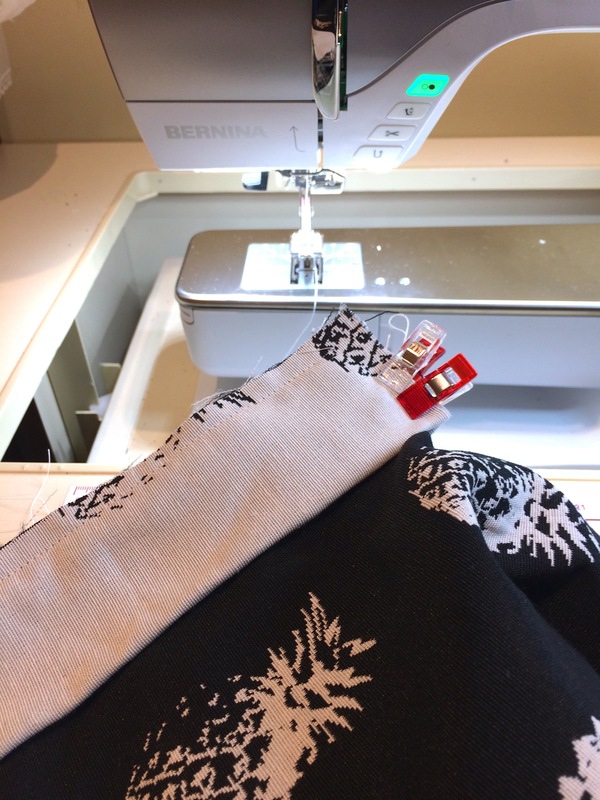 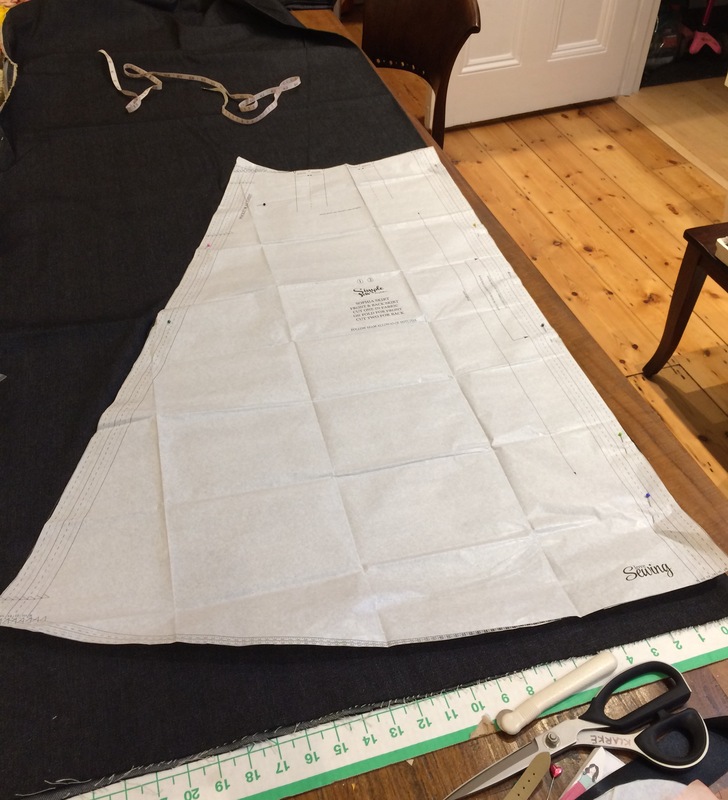 As the fabric had a stretch to it I decided to make it a pull on dress, with big pockets – ideal for long haul flights as I have a couple coming up this year. 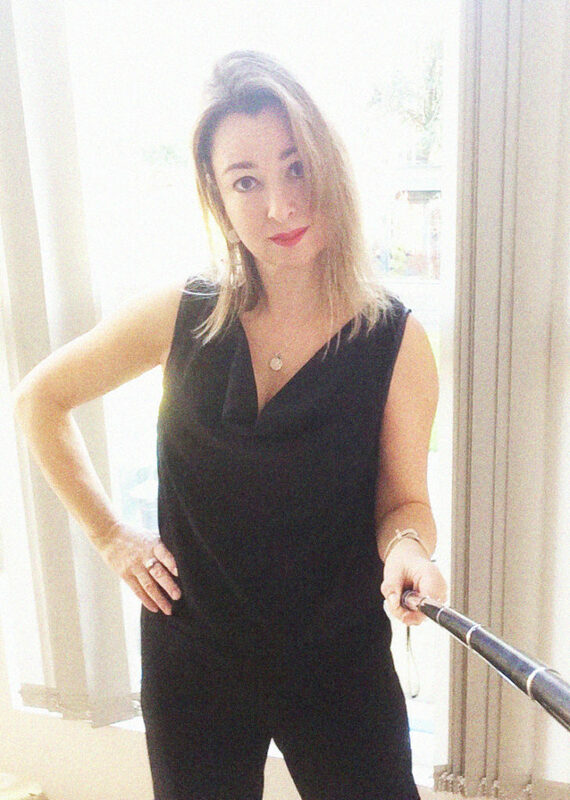 Also I decided to make it a maxi dress which I am rather fond of for traveling when you are going from a cool climate to a hot one. 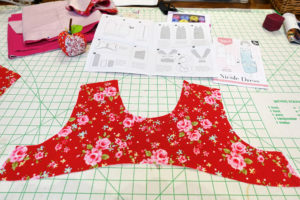 I liked the fact that the pattern had some shaping to it even though it was a relaxed fit. 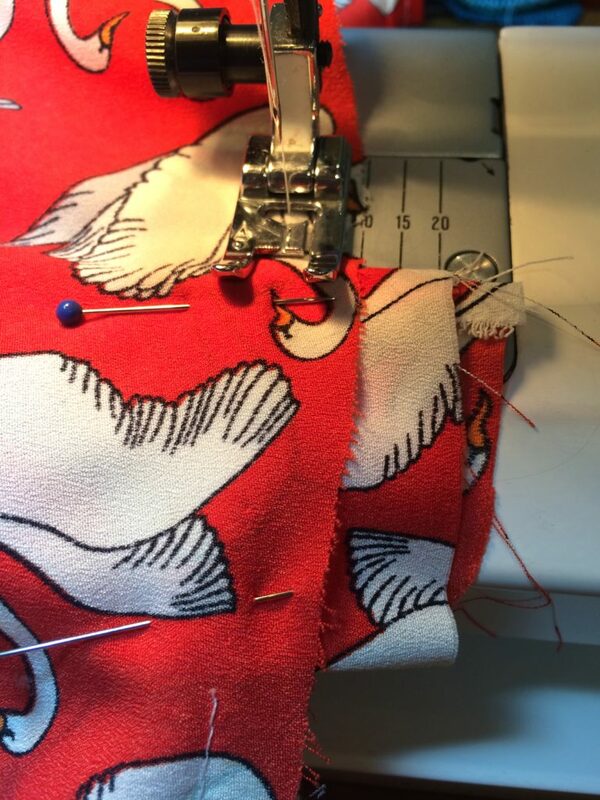 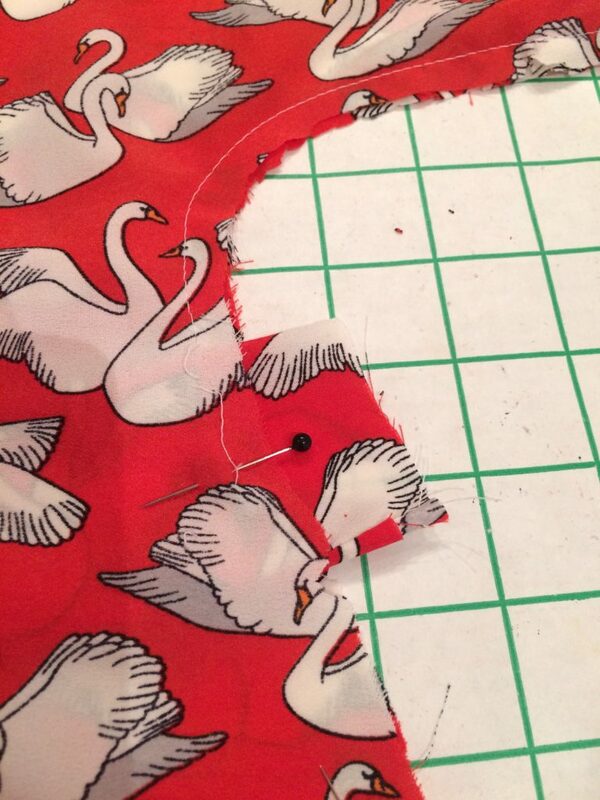 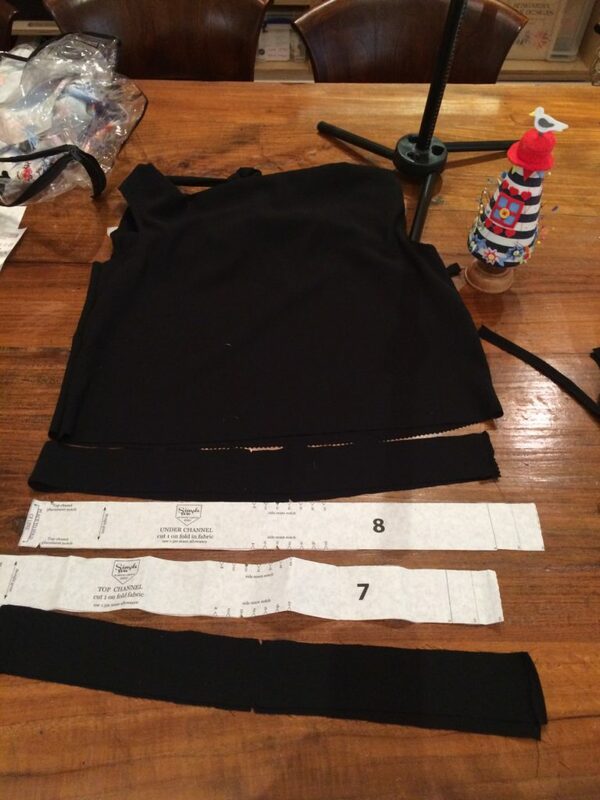 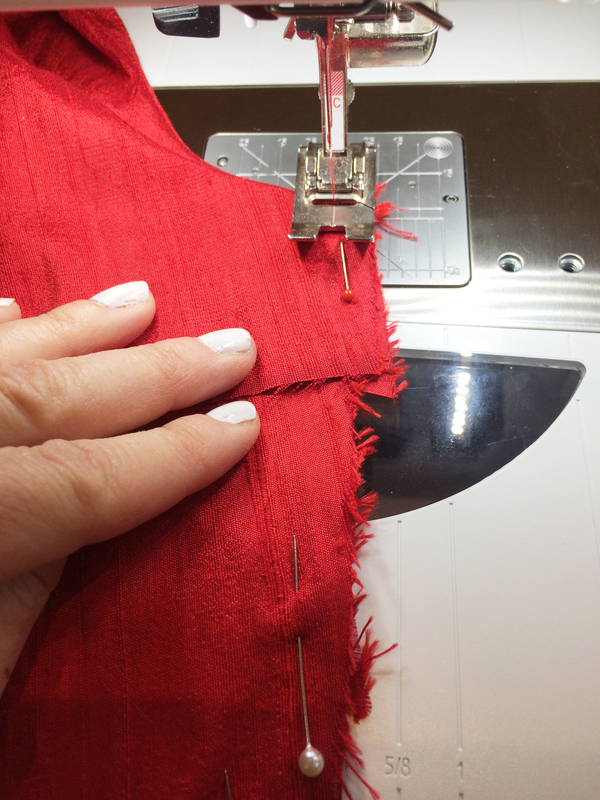 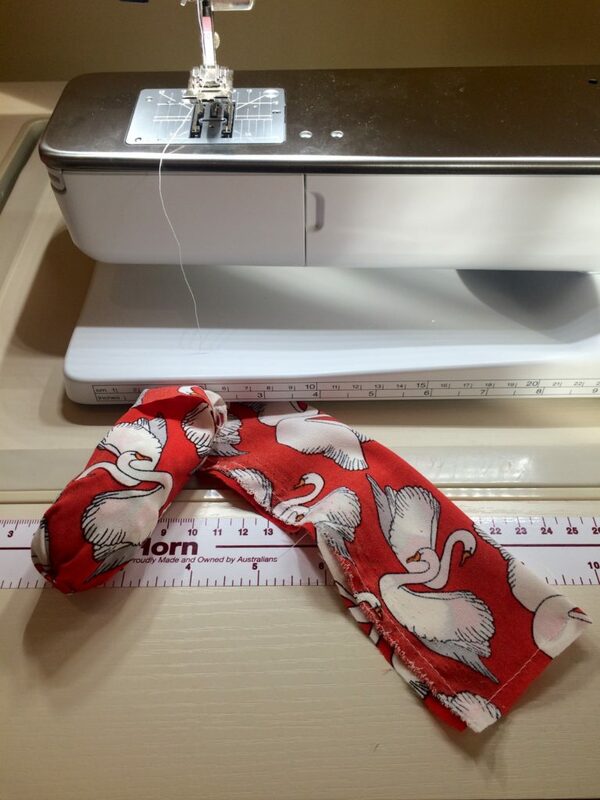 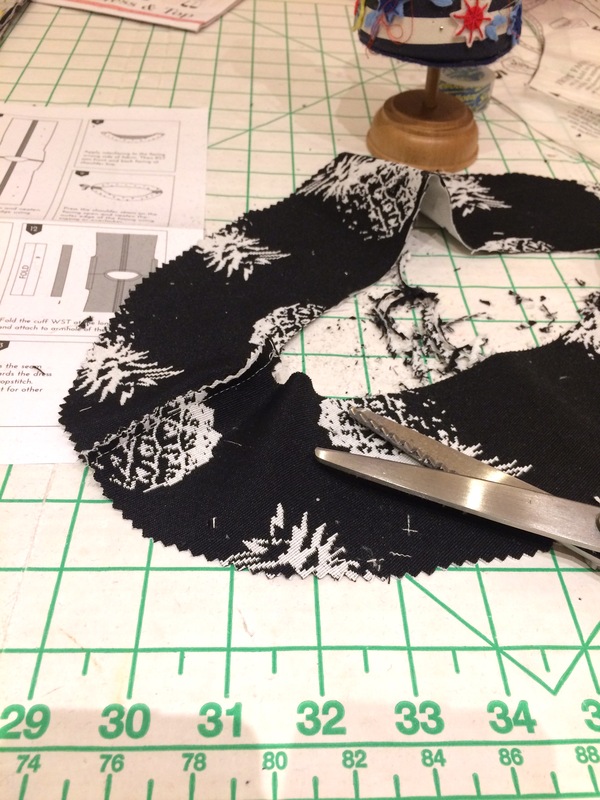 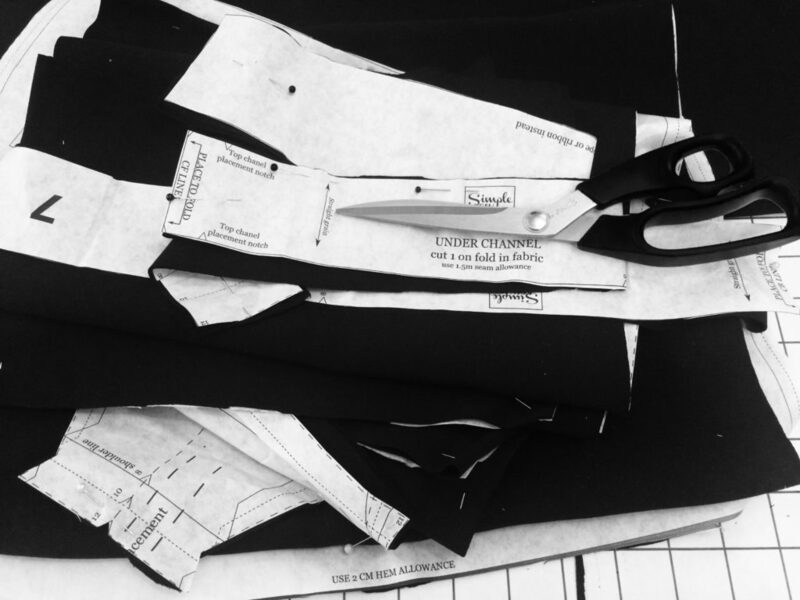 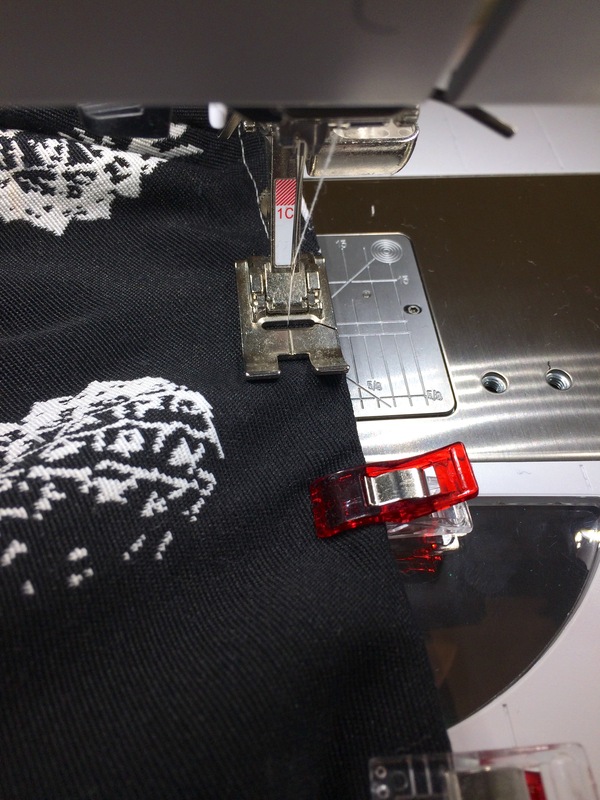 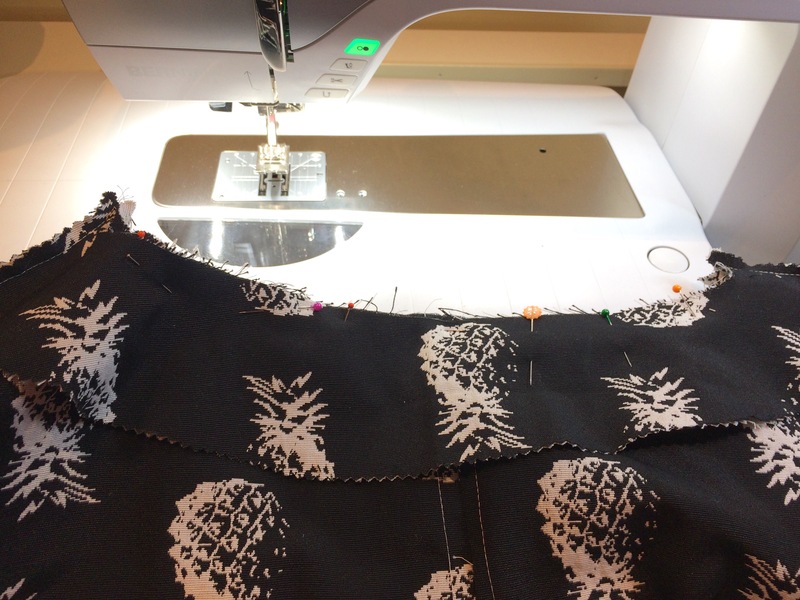 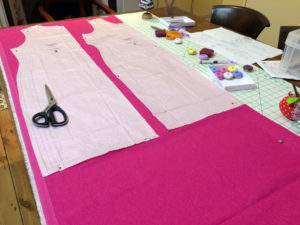 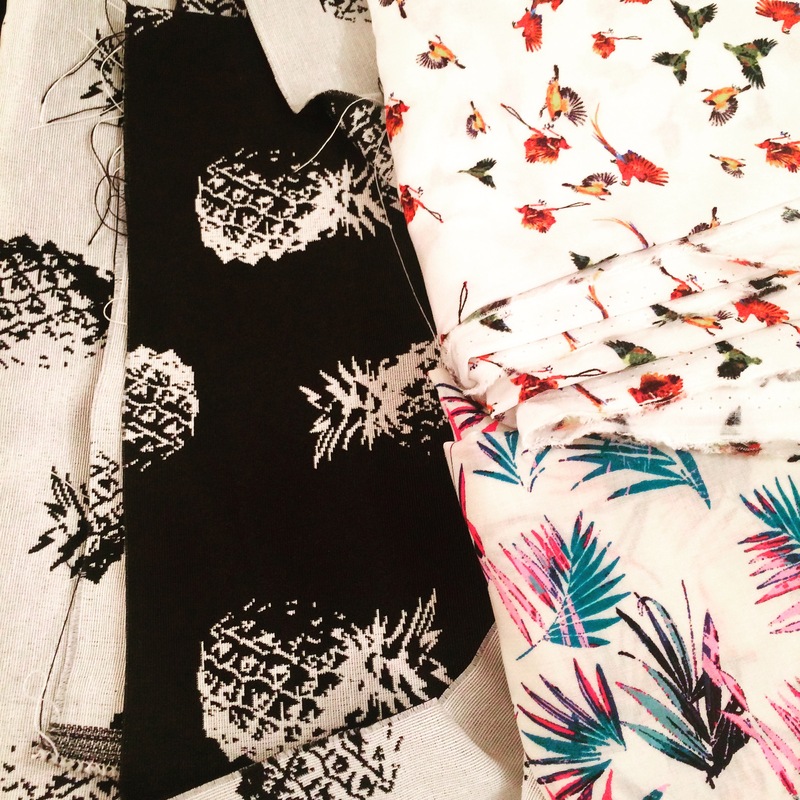 Trying to minimise waste – I often cutout 2 different patterns from the same fabric. 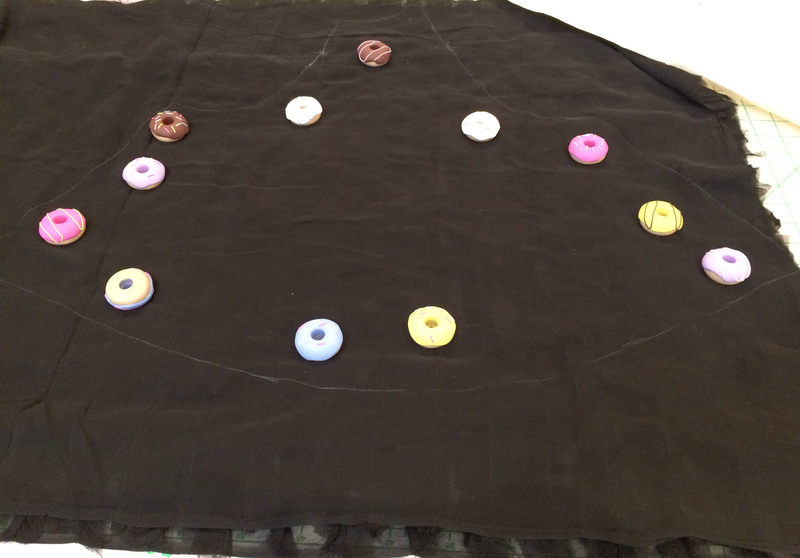 Loving my donut weights. 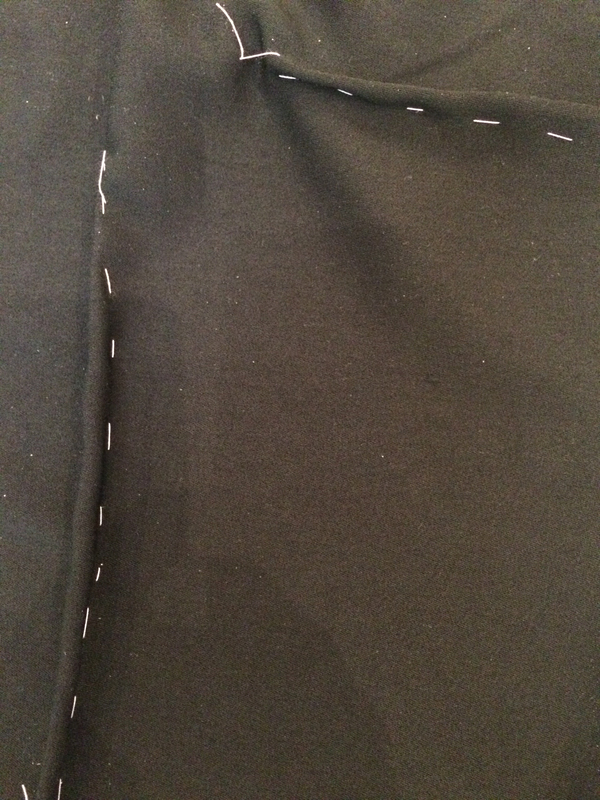 Time to make up the facing, by stitching the front to the back. 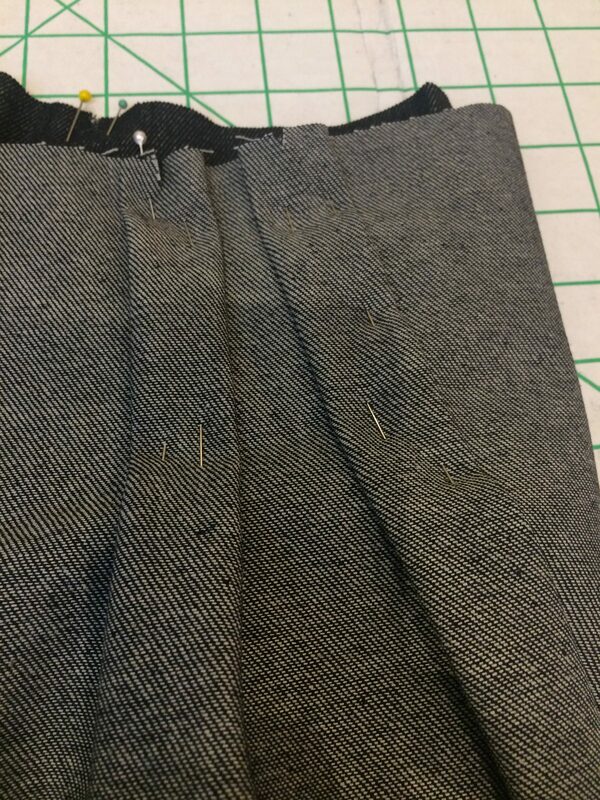 I used a light weight interfacing as the facing was a light weight cotton. 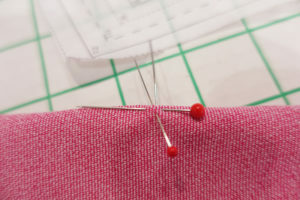 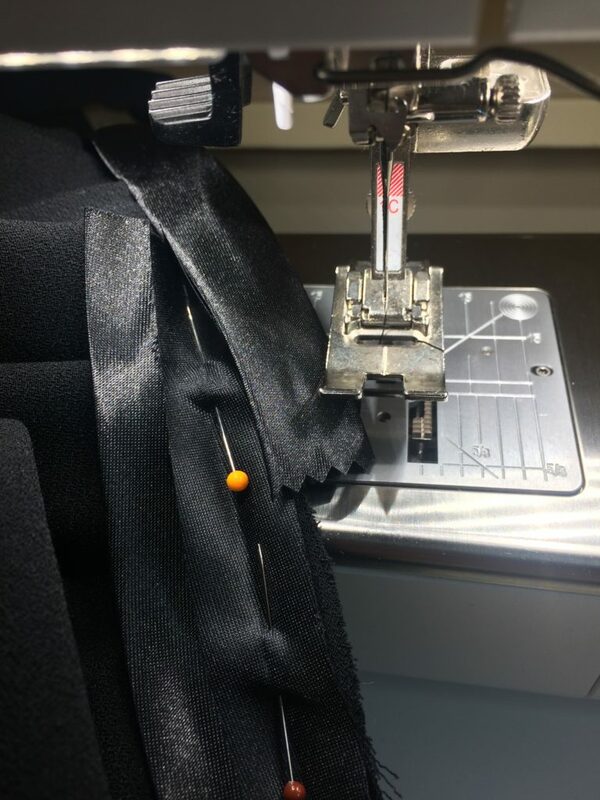 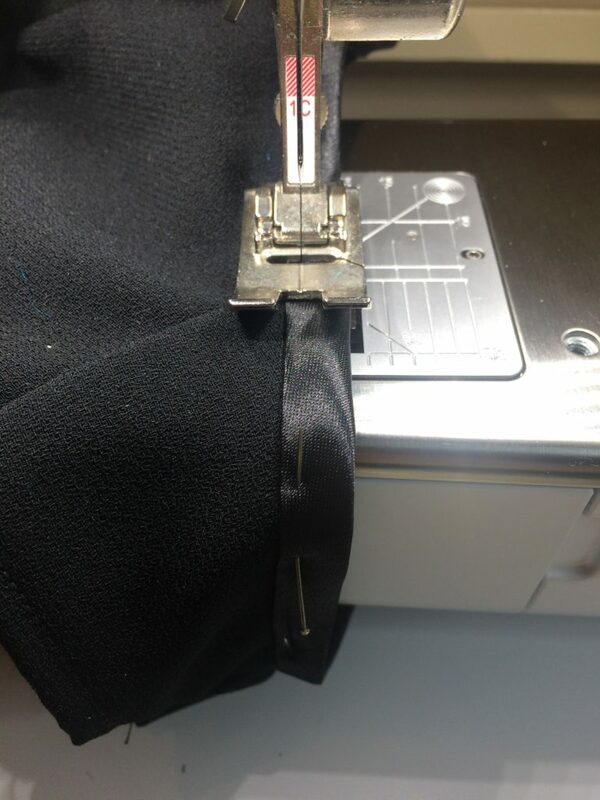 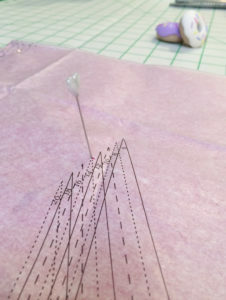 Making the darts: I put a pin through from the bust point to the other side of the fabric and then marked it with a pin. 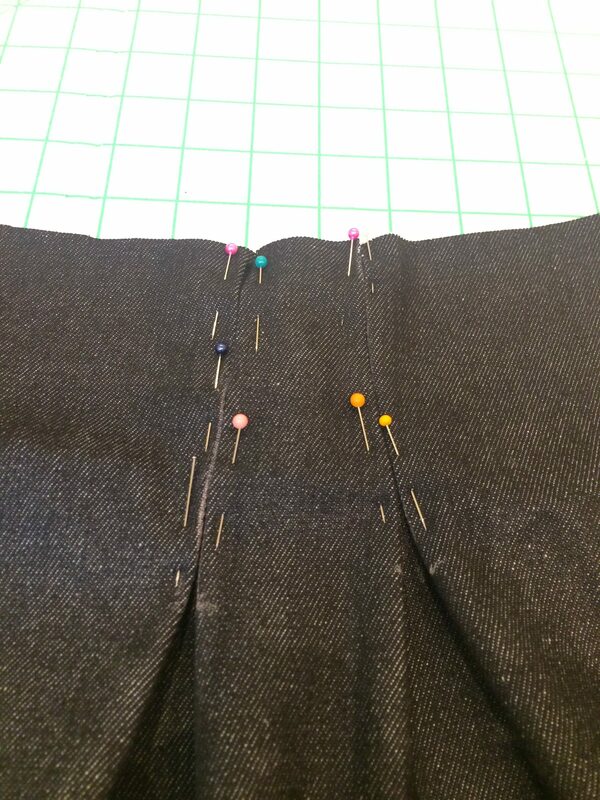 Normally I would have put a tacking stitch in but this worked as a quick fix. 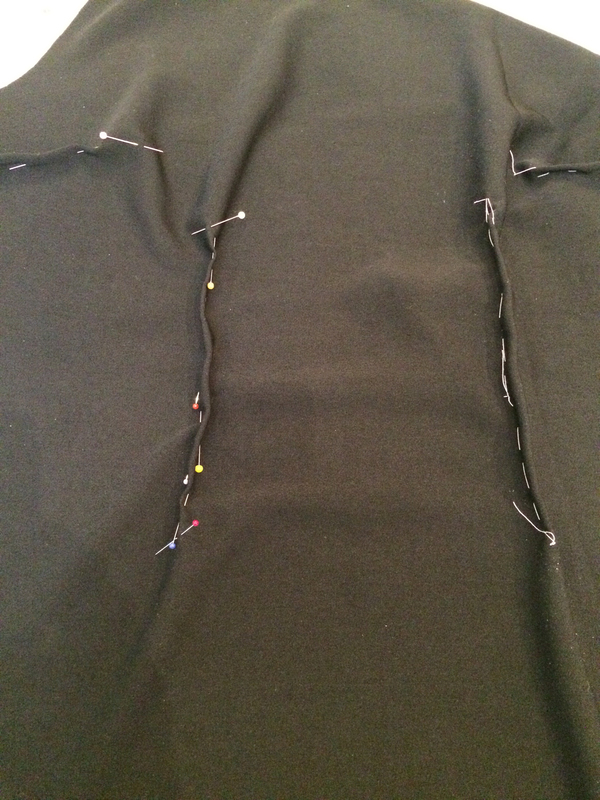 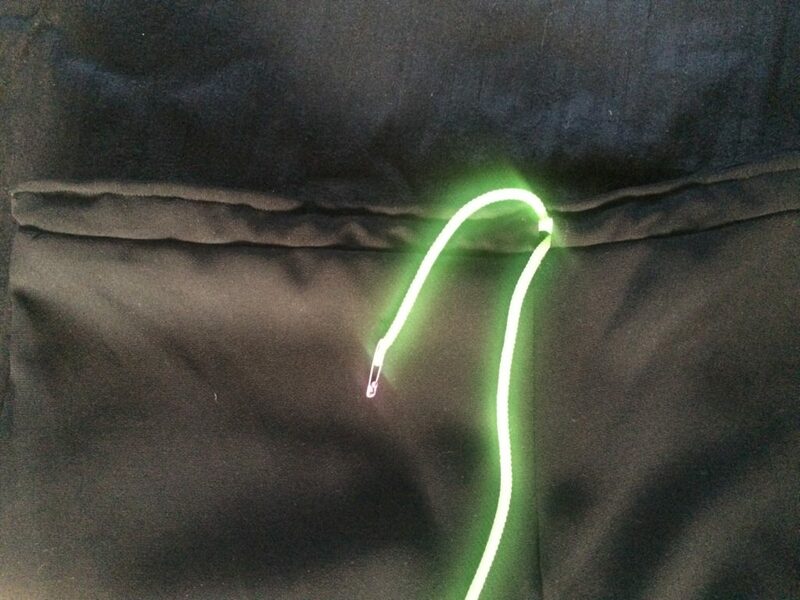 I started stitching the dart from the armhole and ended it by tying it off at the end. 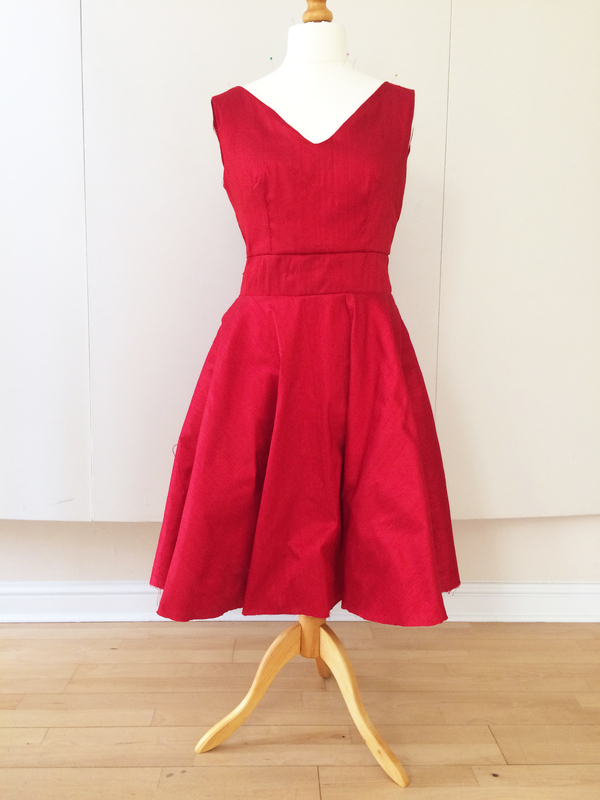 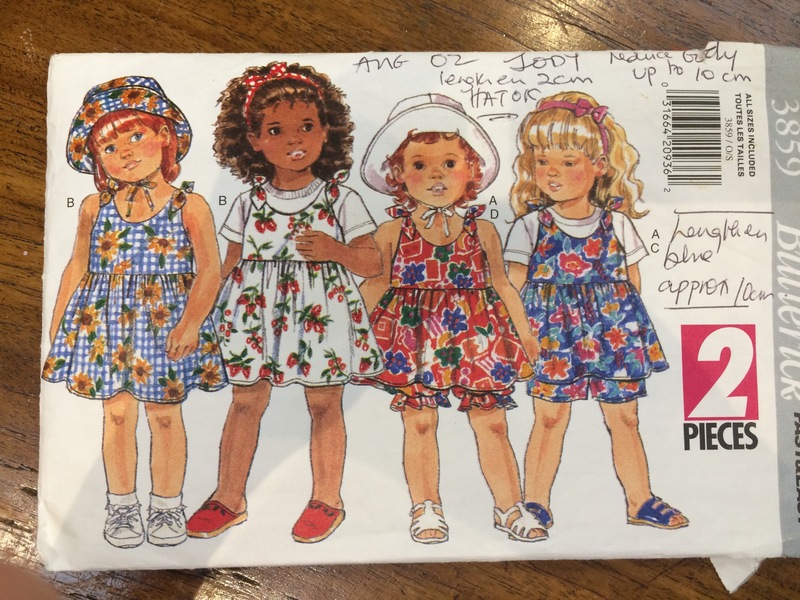 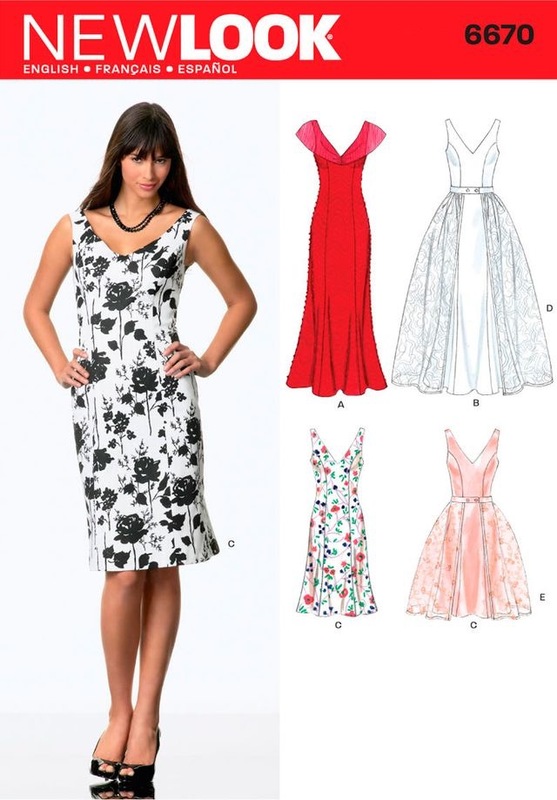 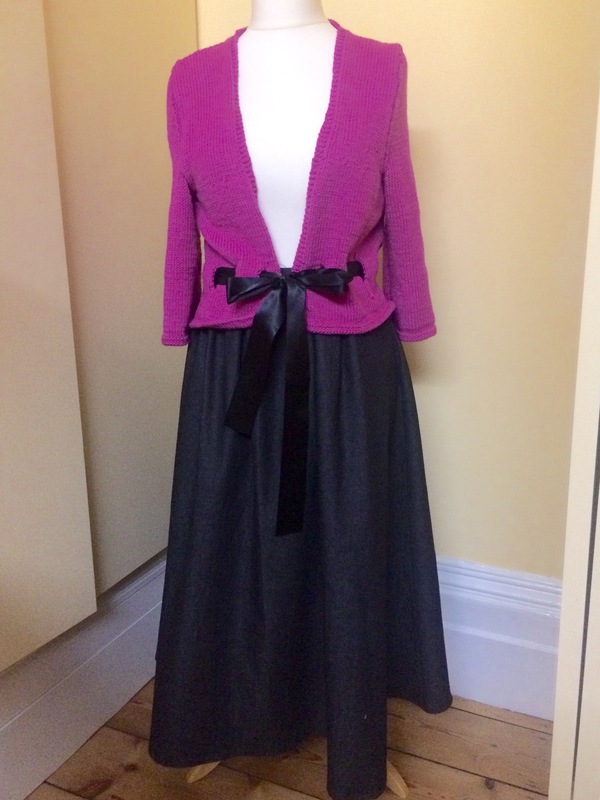 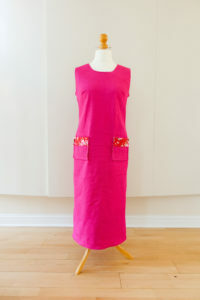 I love this dress and would recommend the pattern, its quick to make and versatile. 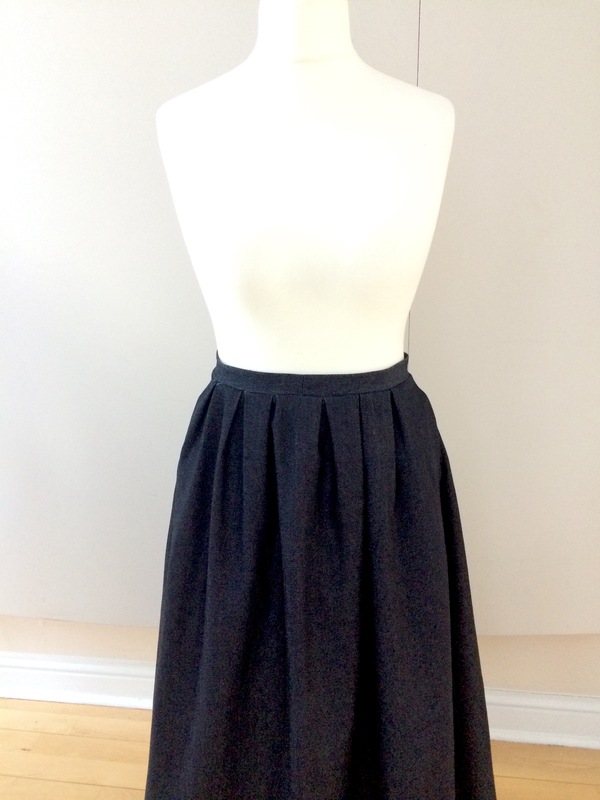 This version in stretch denim is perfect for the spring. 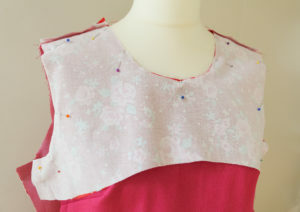 I am going to make a mini one is cotton for later in the summer…watch this space.